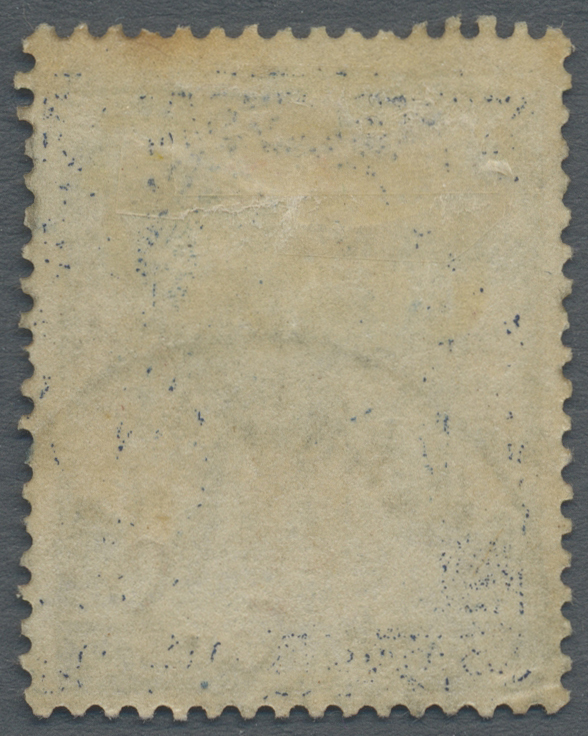 9888 Sc #1747/50 Proof 1997. 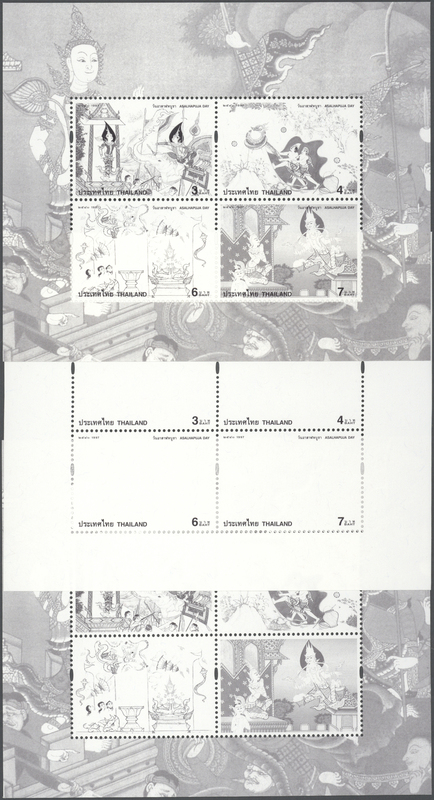 Asalhapuja Day. 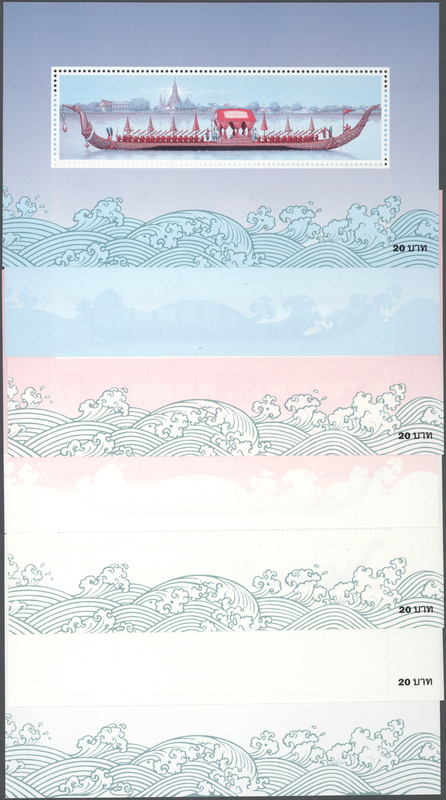 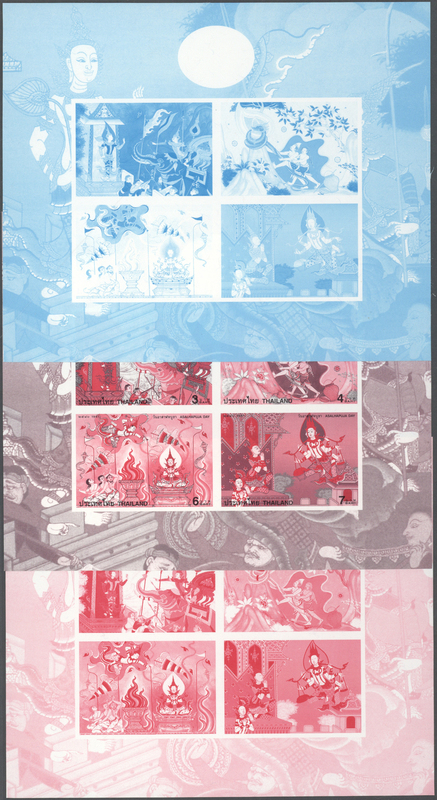 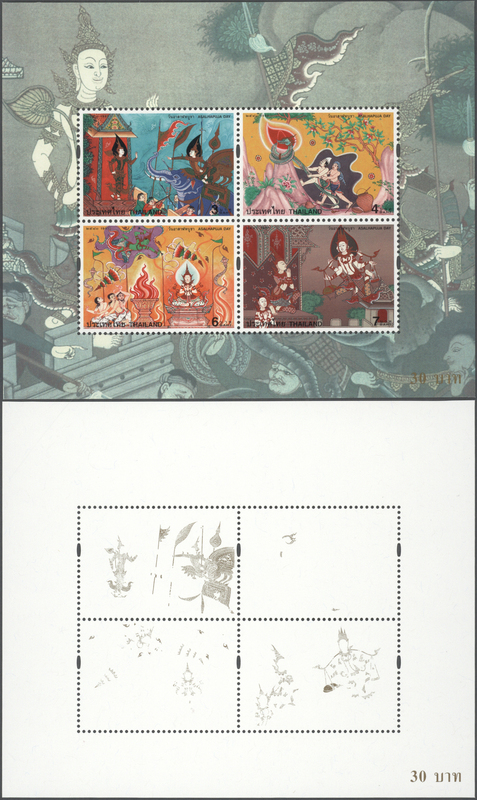 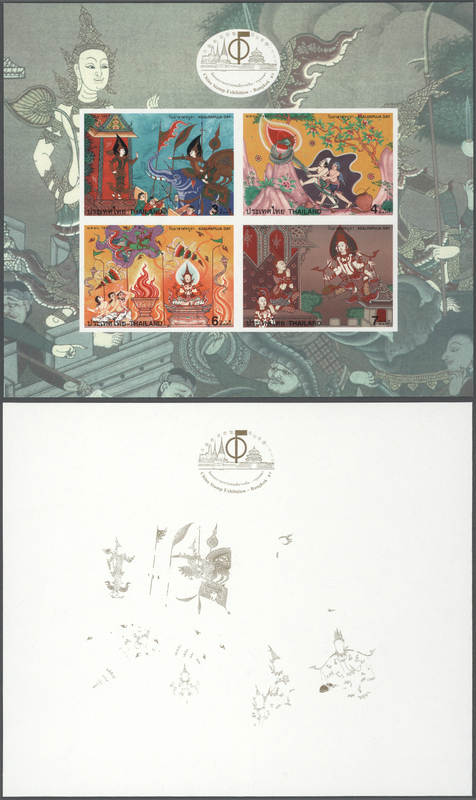 Complete set (4 values) on signed printing card. 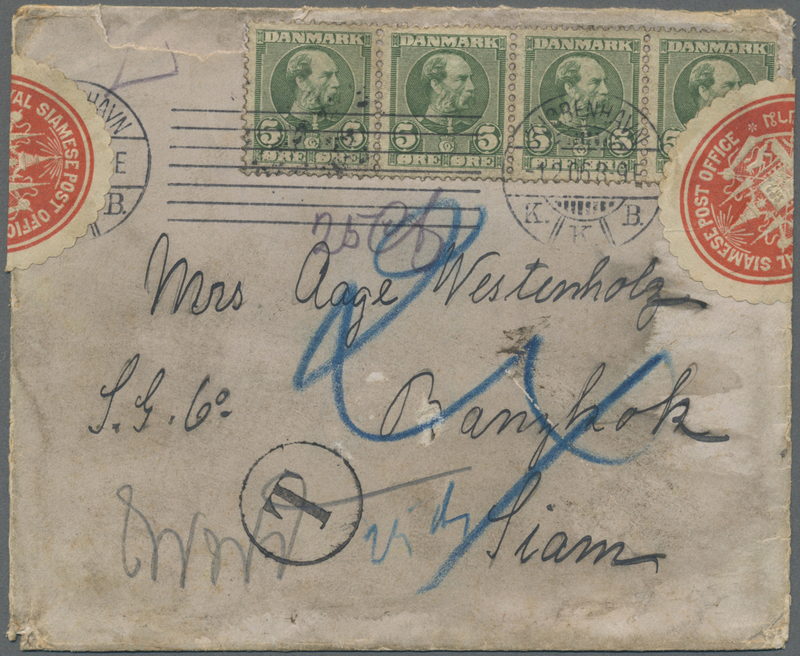 9913 Brief (cover) 1906, Denmark cover 5 Oe. 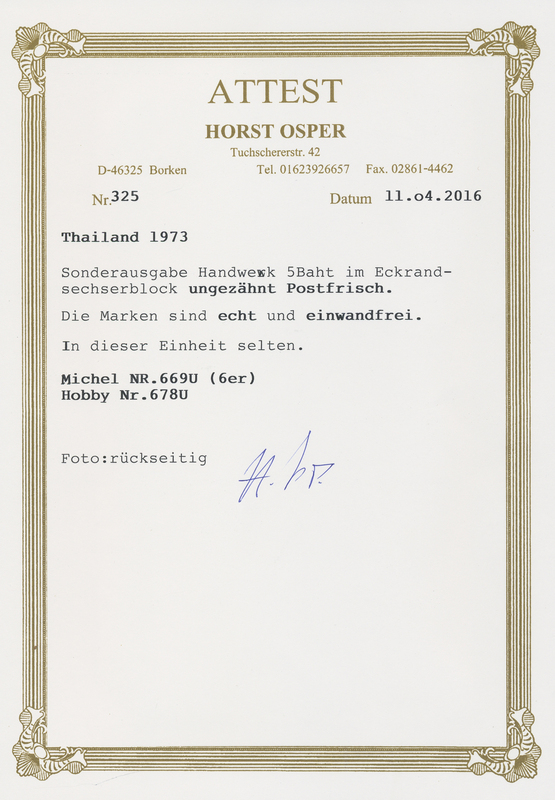 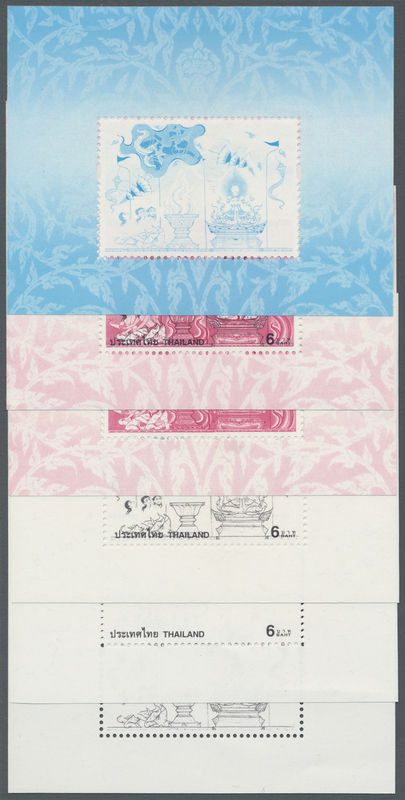 (4) tied "KJOBENHAVN 1 2 06" to small cover to Bangkok, marked circular "T" and blue crayon "24", transits "TSINGTAU" and "VICTORIA HONG KONG", arr. 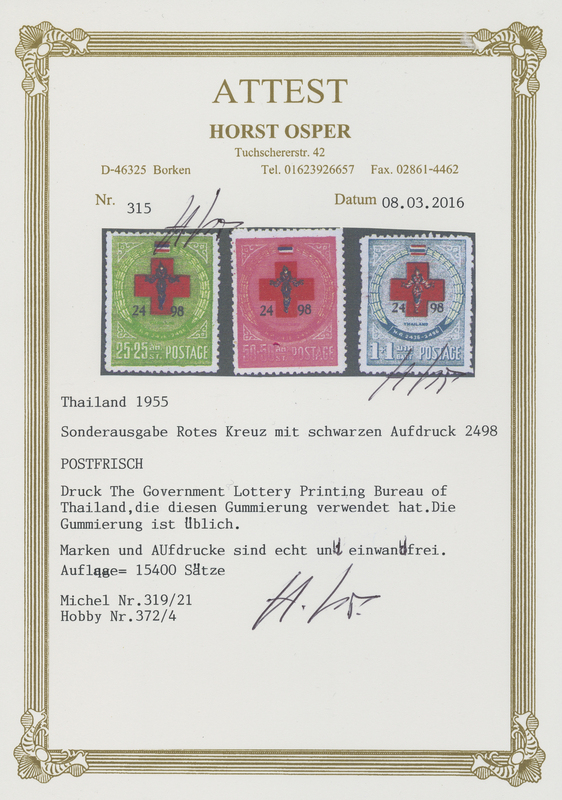 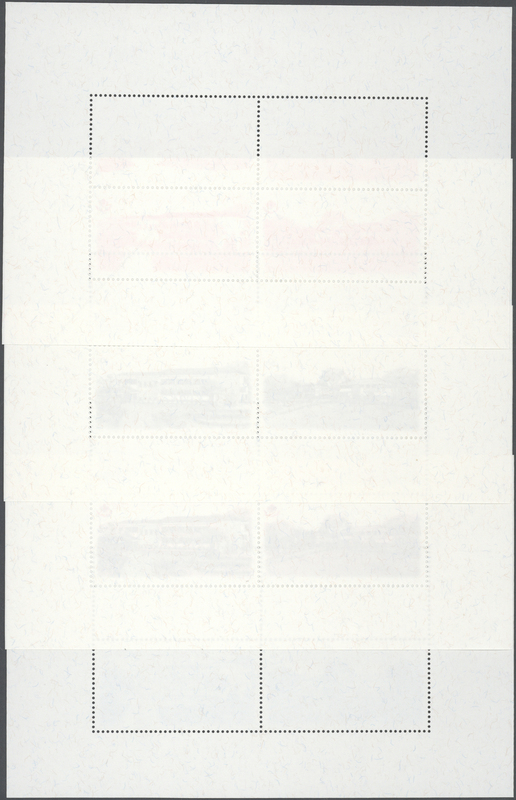 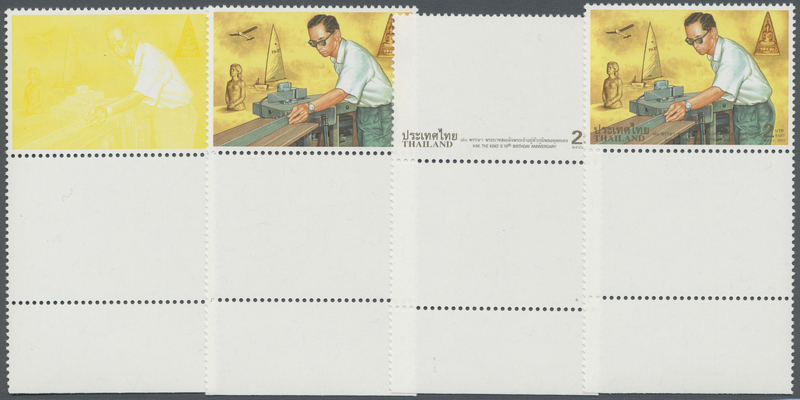 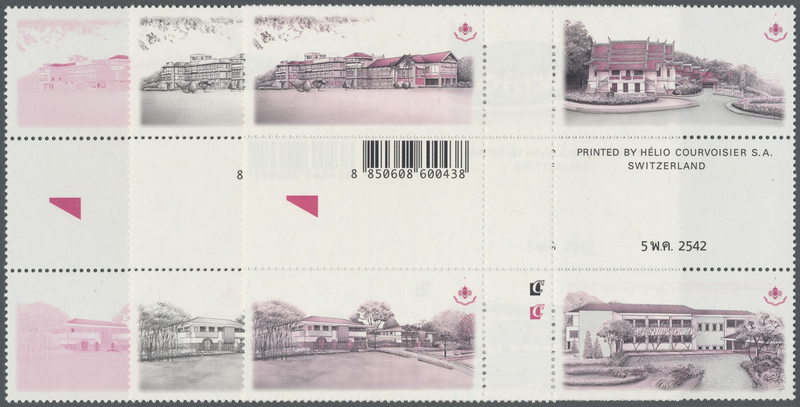 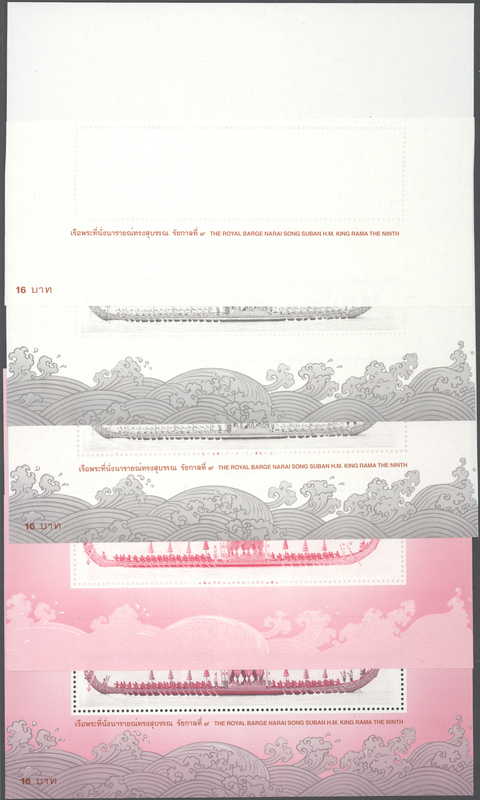 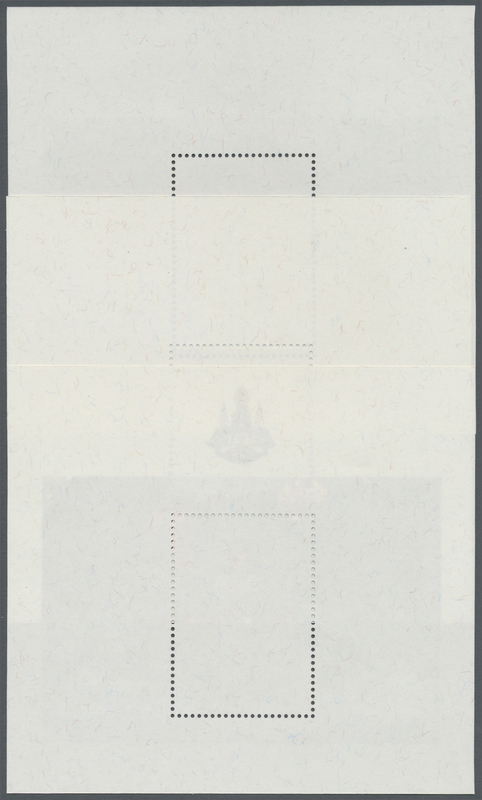 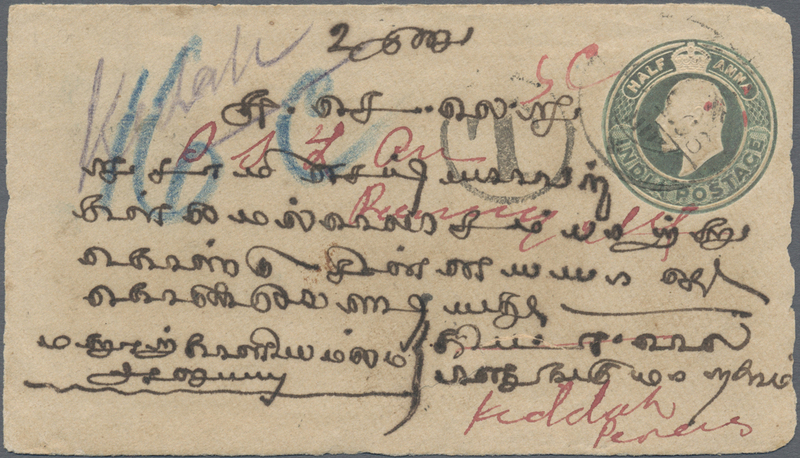 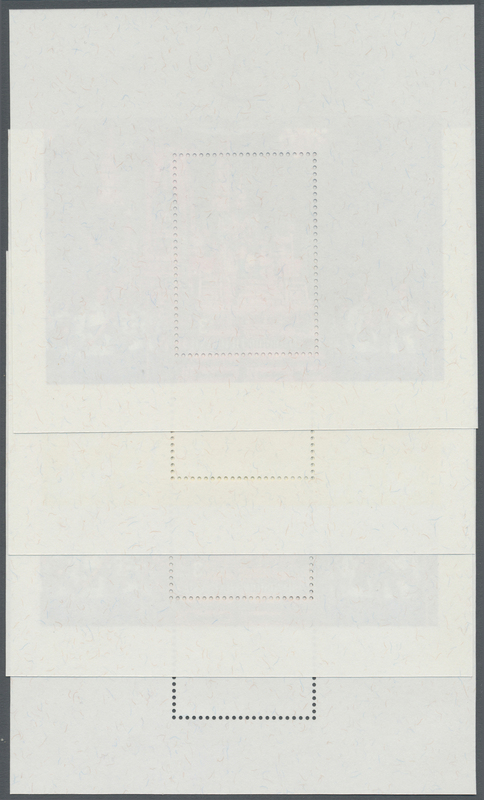 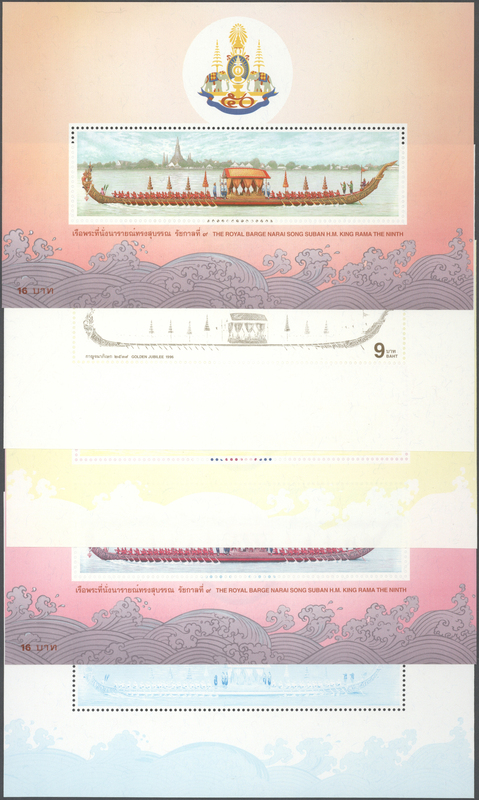 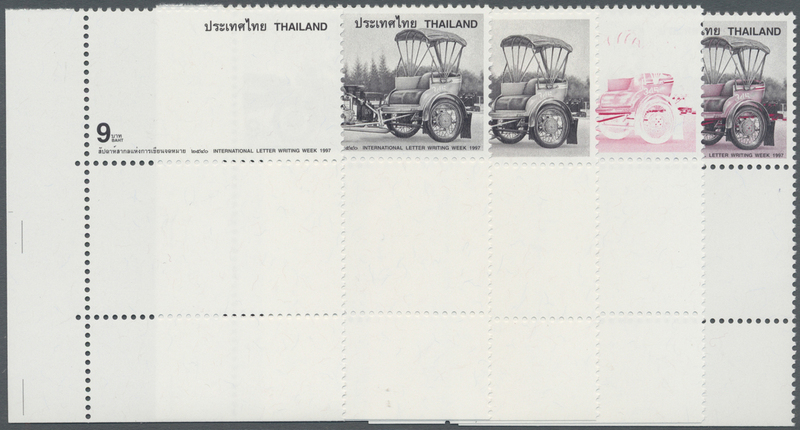 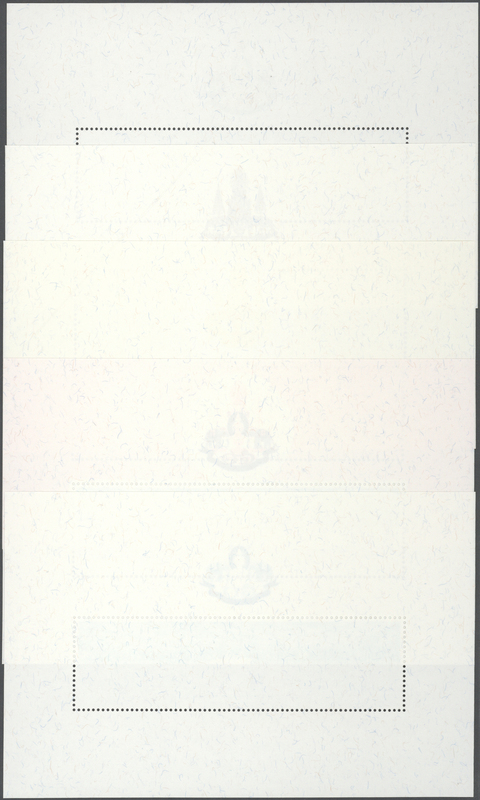 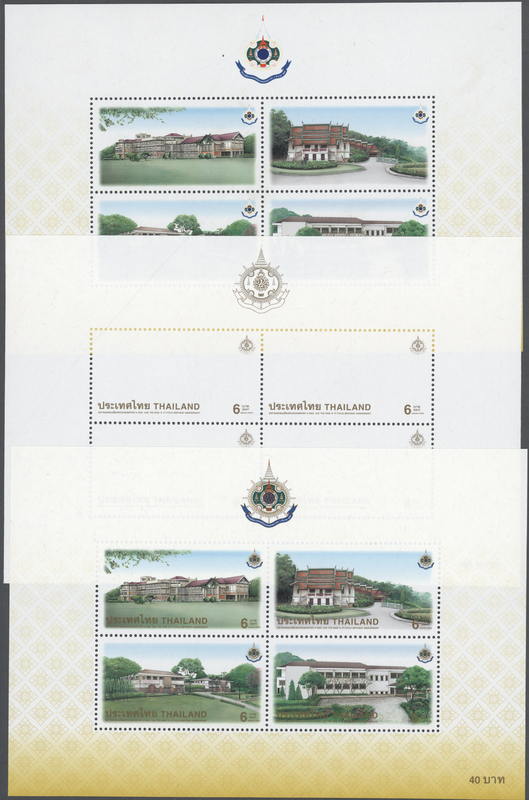 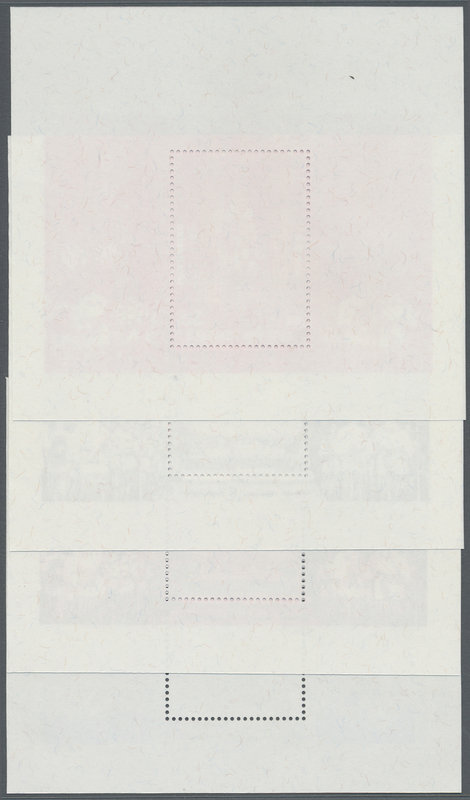 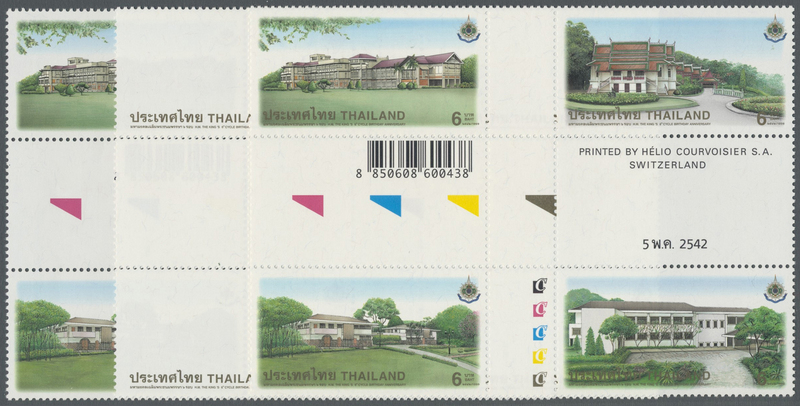 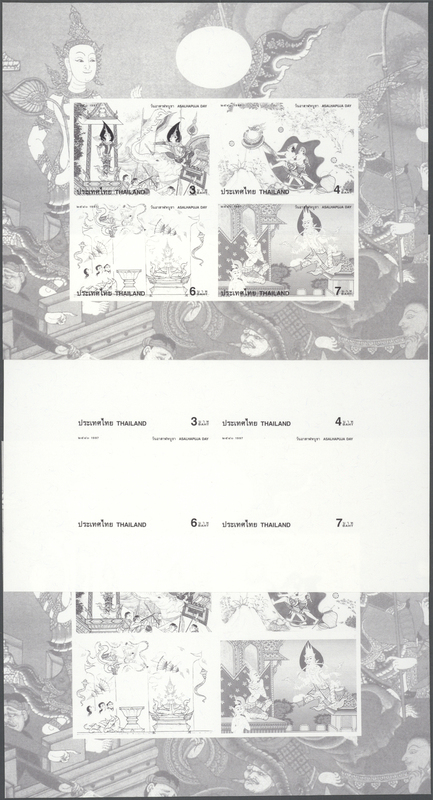 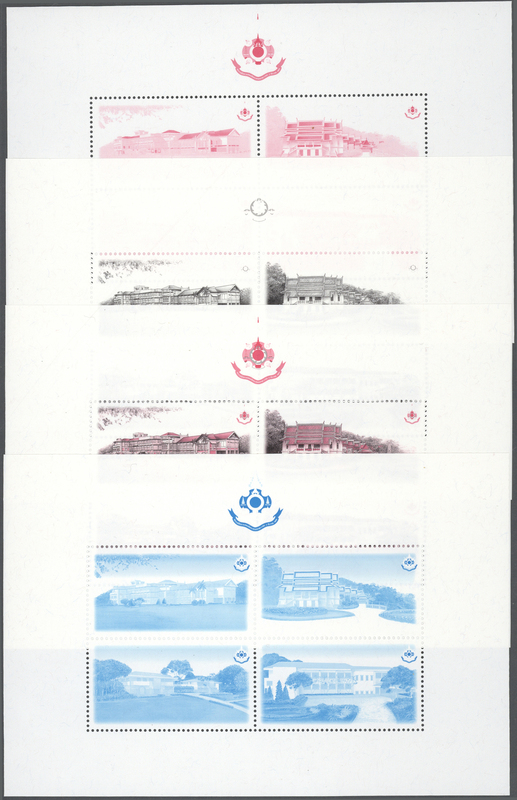 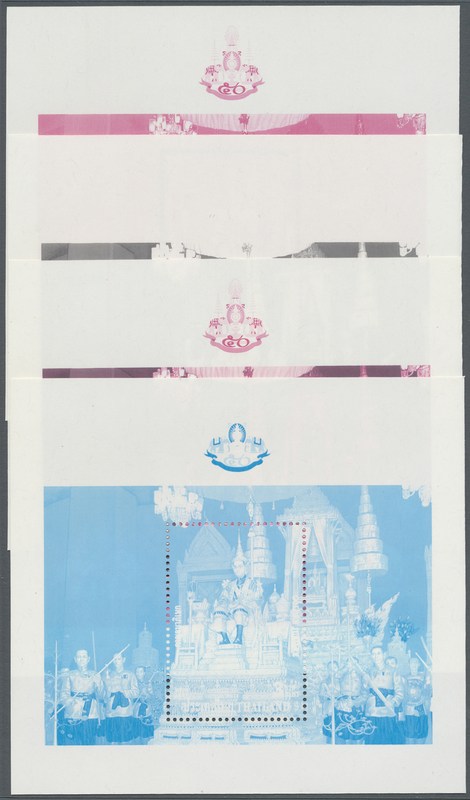 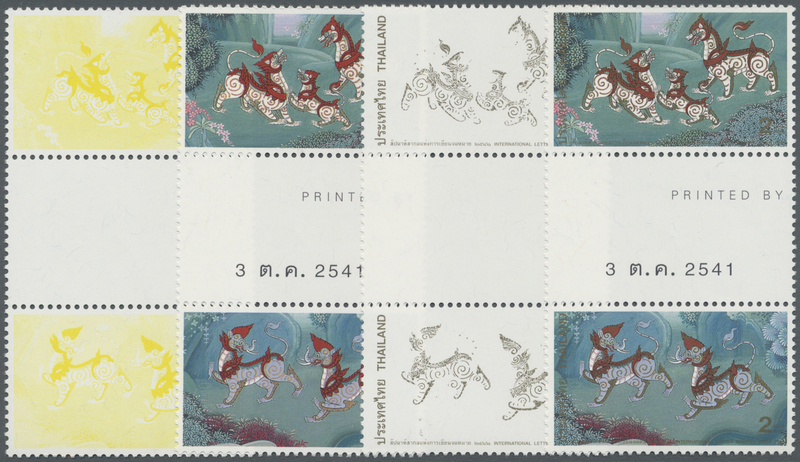 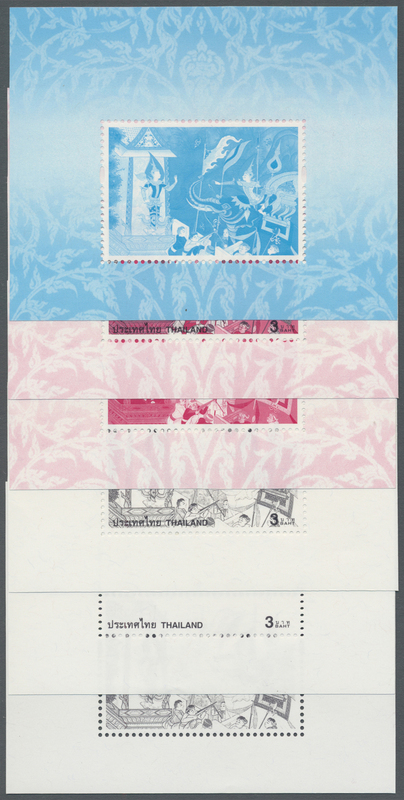 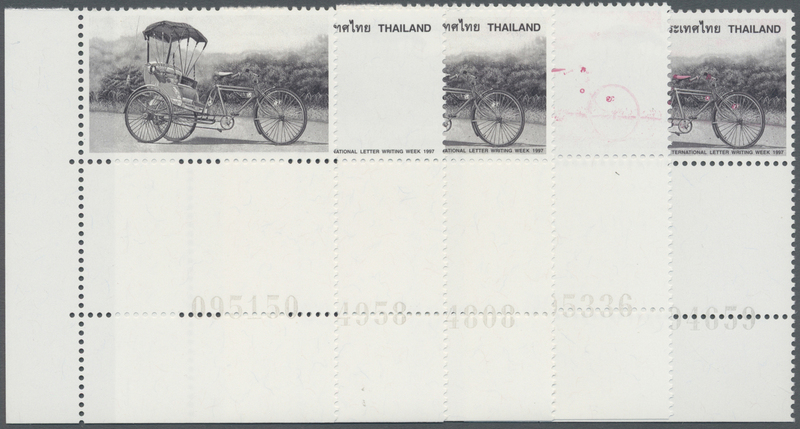 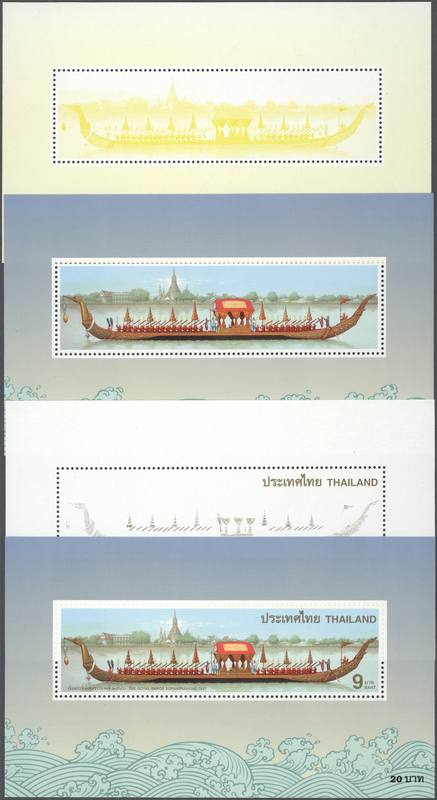 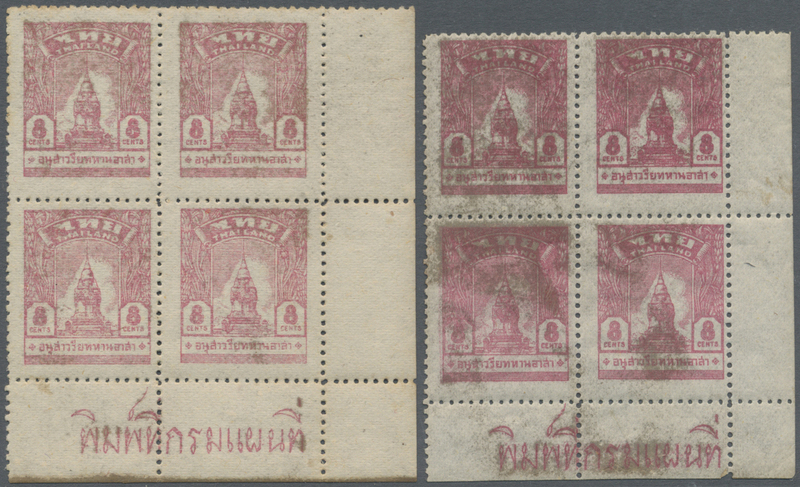 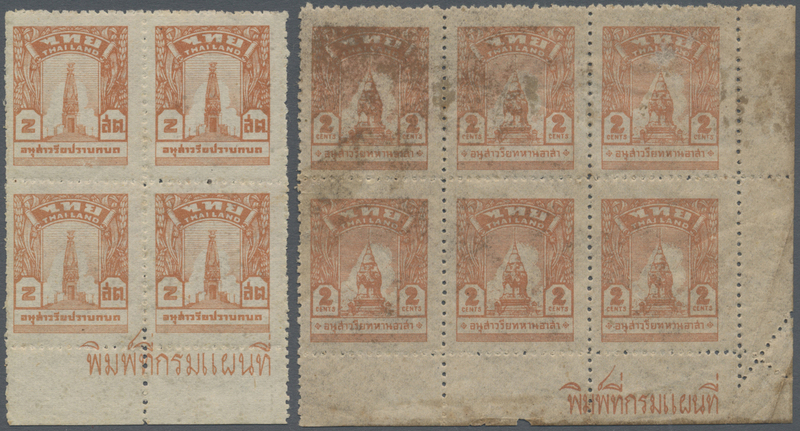 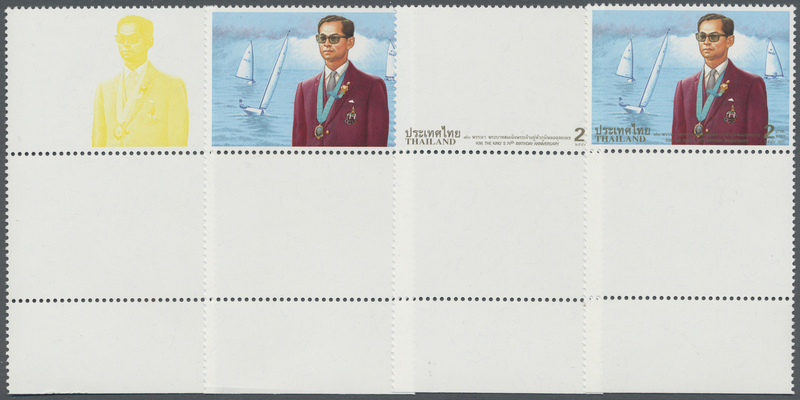 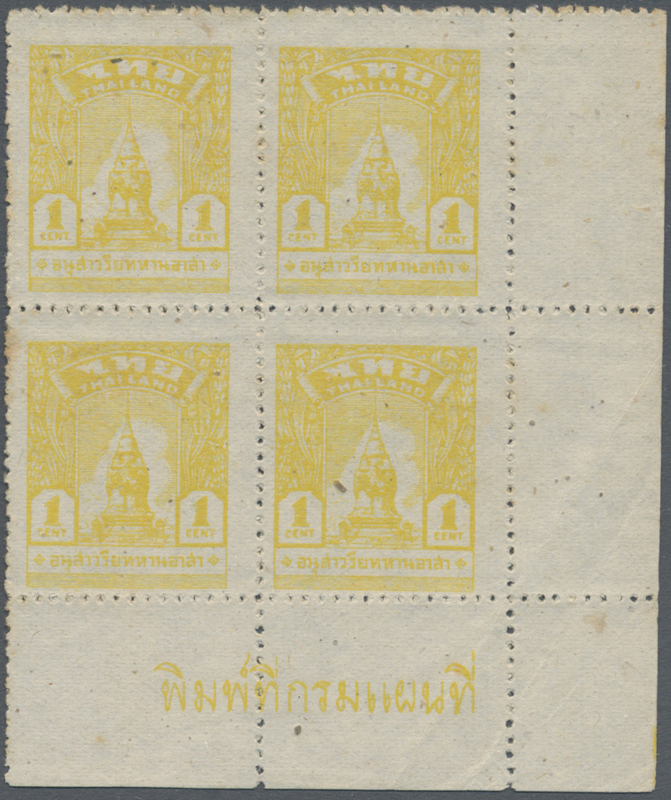 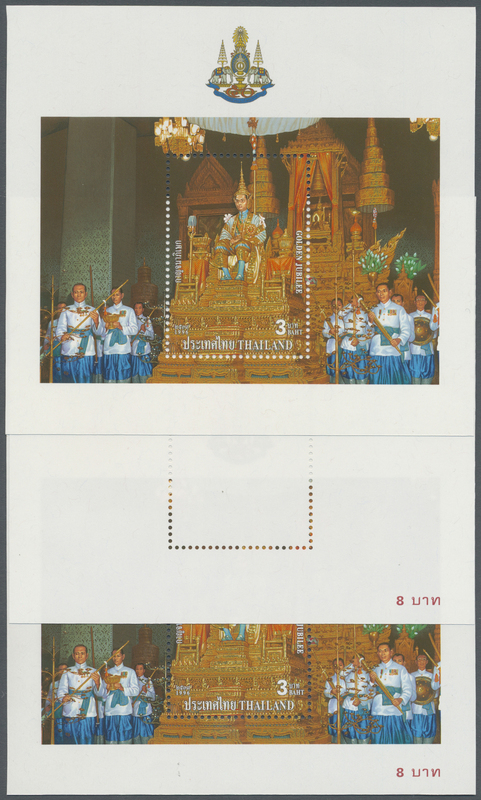 "BANGKOK 1-4 1906" and opened/resealed by two copies of red embossed paper seals "ROYAL SIAMESE POST OFFICE". 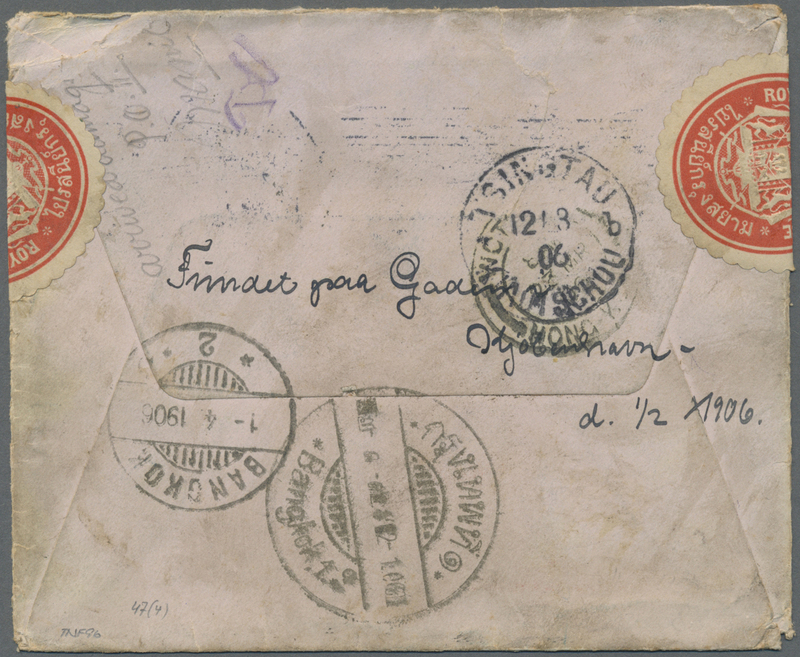 A well travelled cover, soiled. 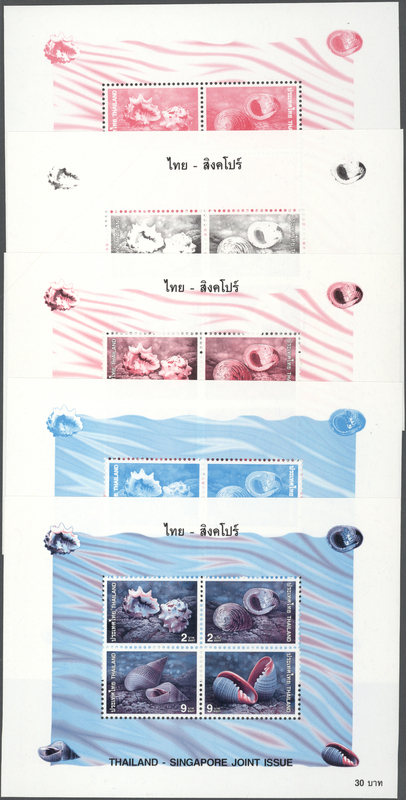 9916 4er (Block) ungebraucht ohne Gummi (unused without gum) (*) 6a (4) 1944 1c. 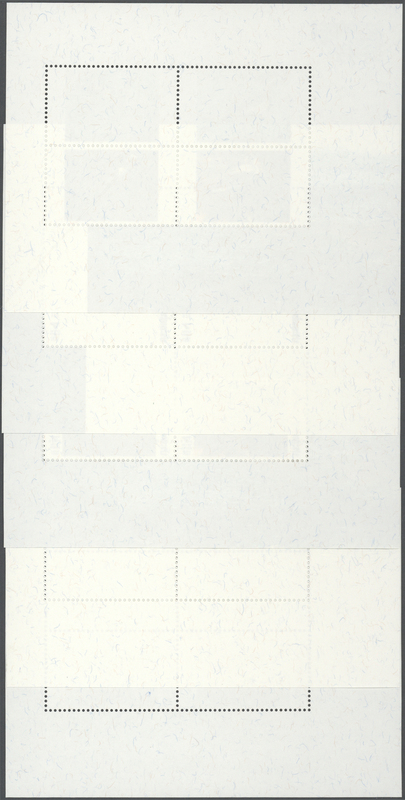 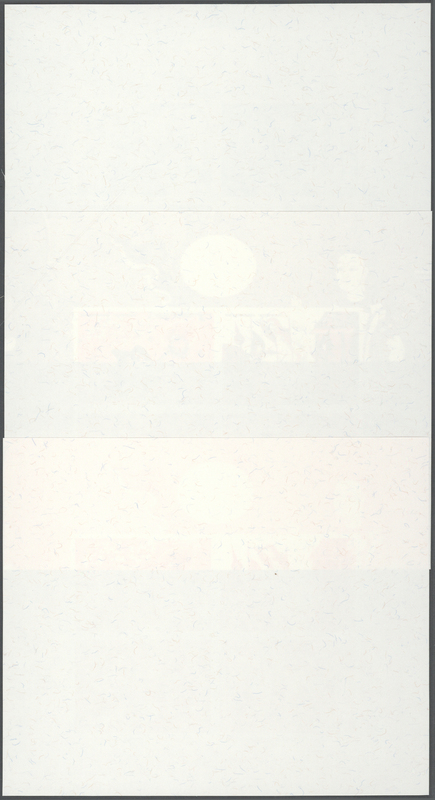 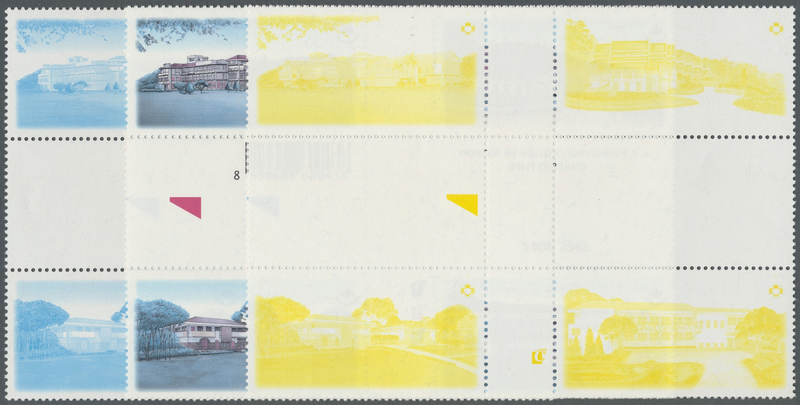 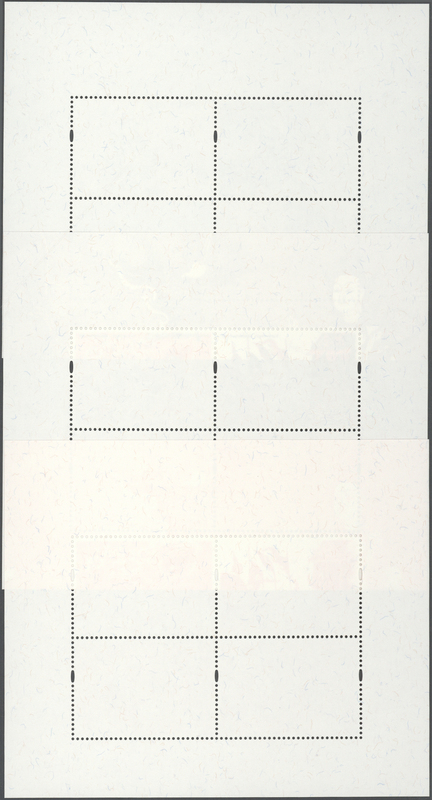 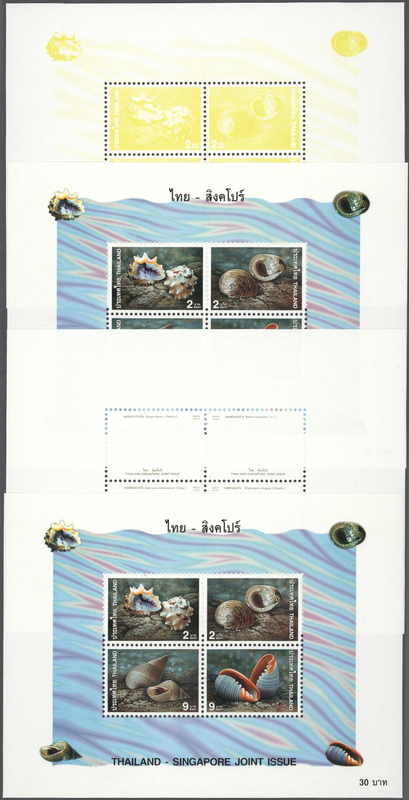 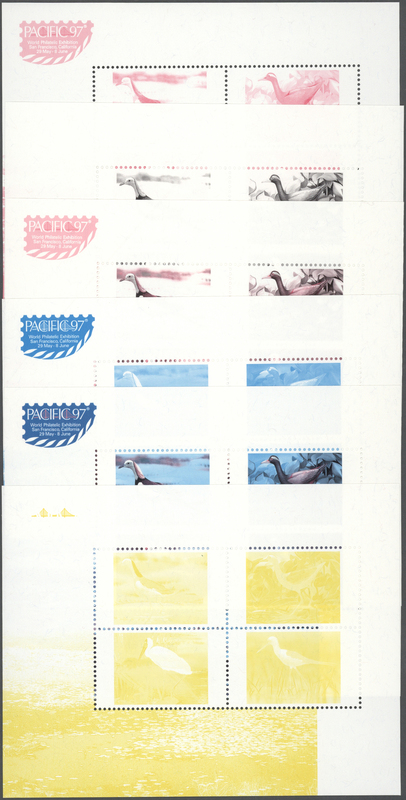 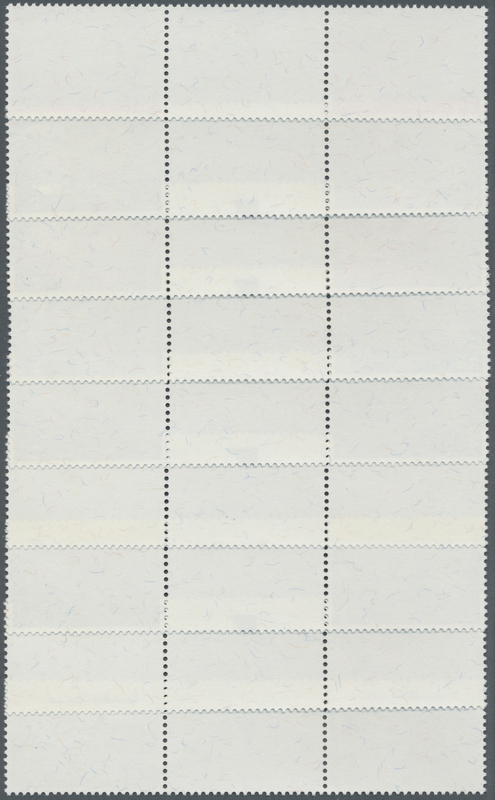 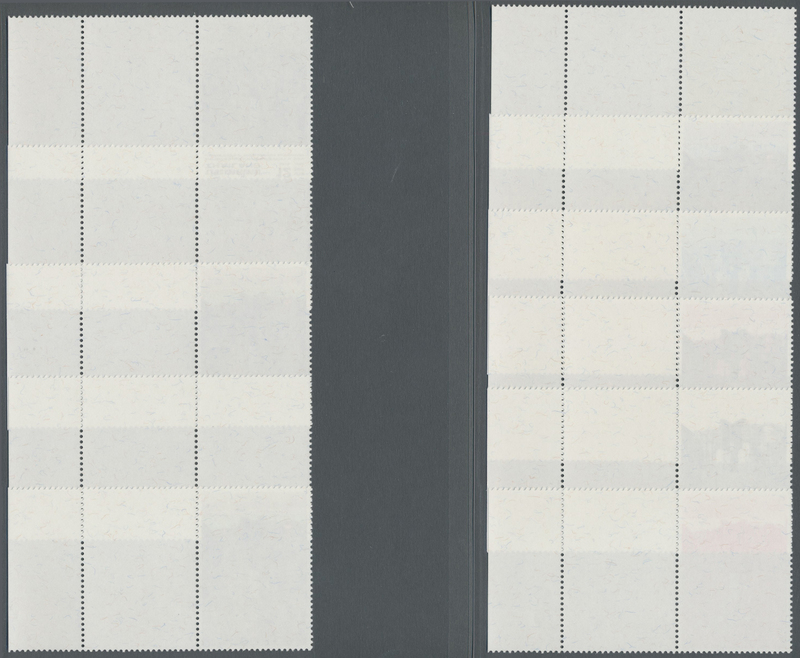 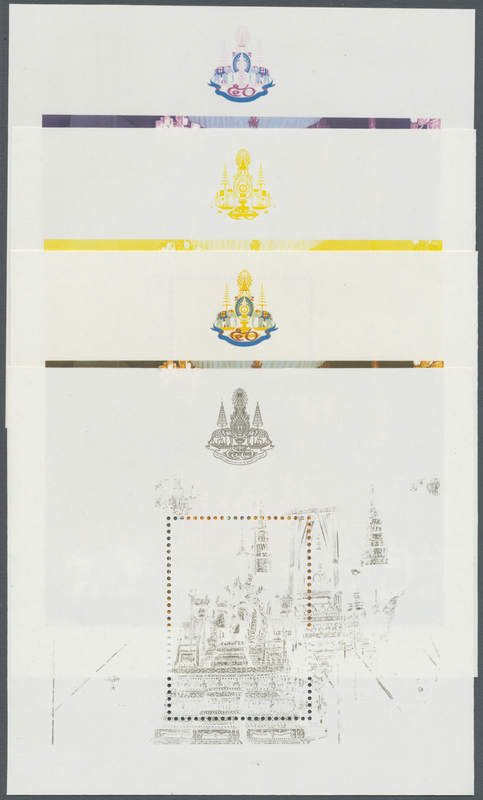 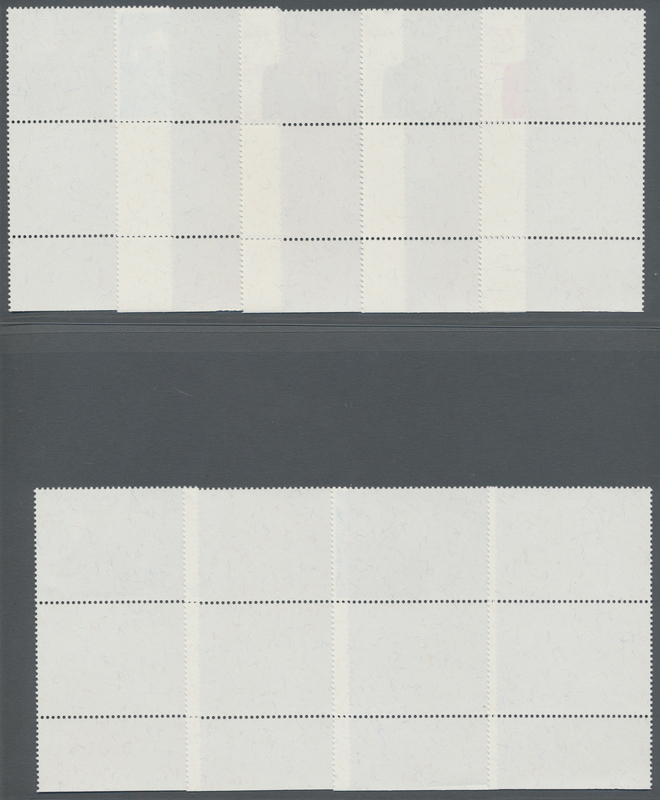 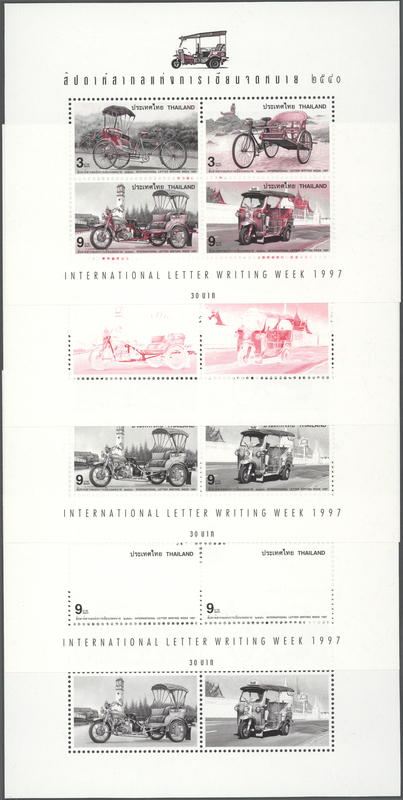 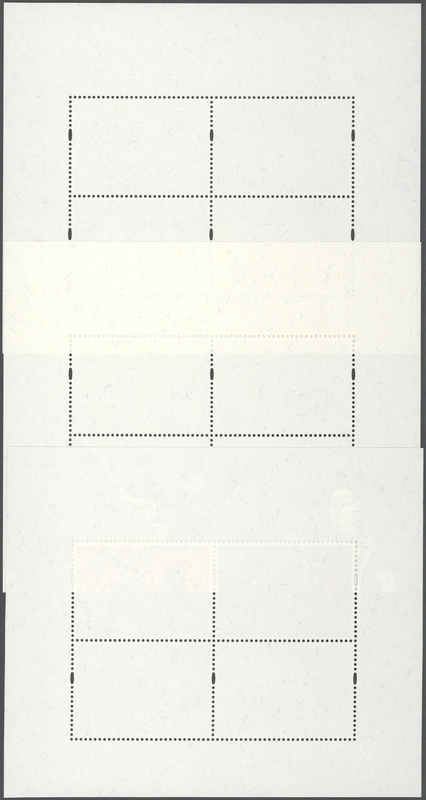 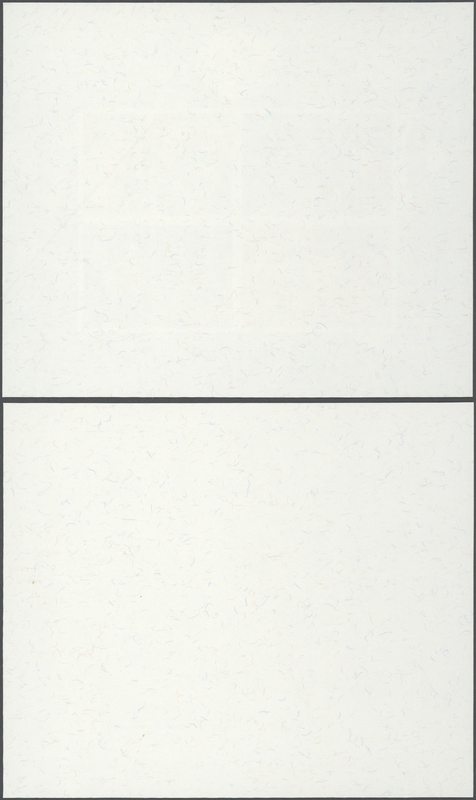 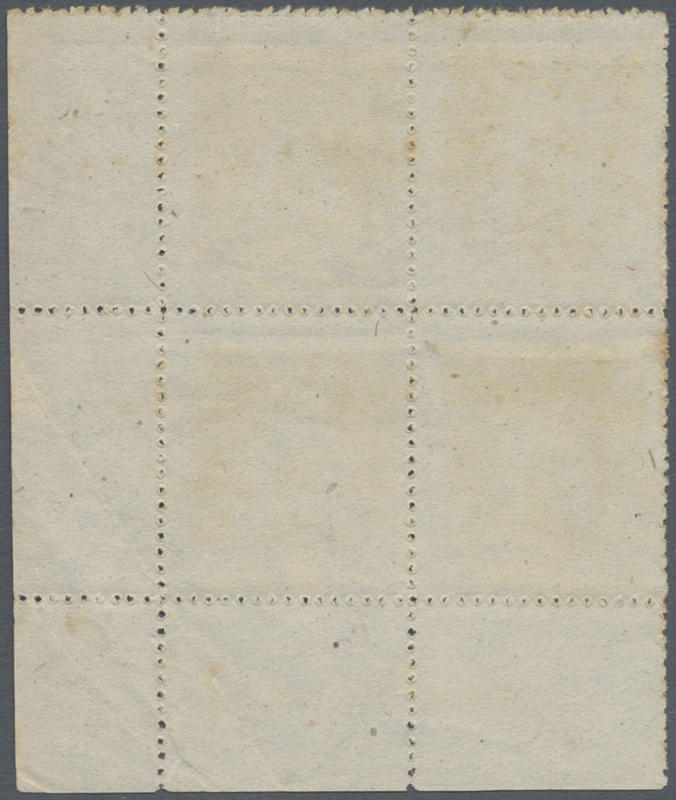 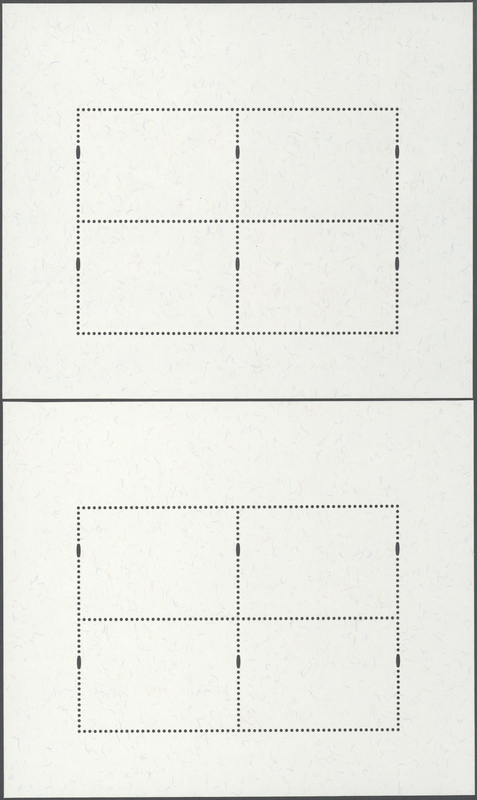 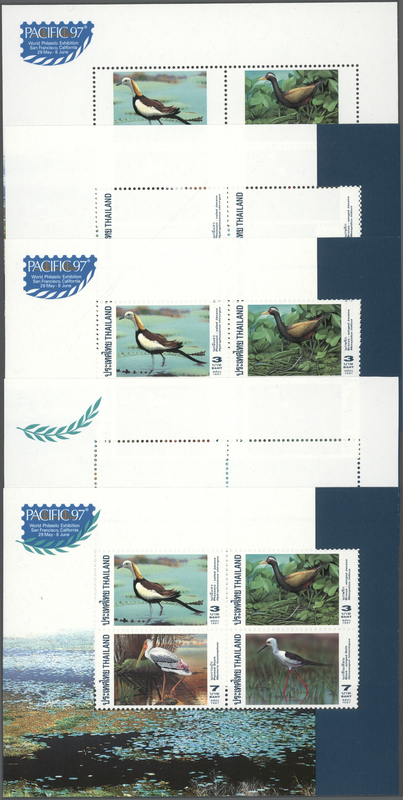 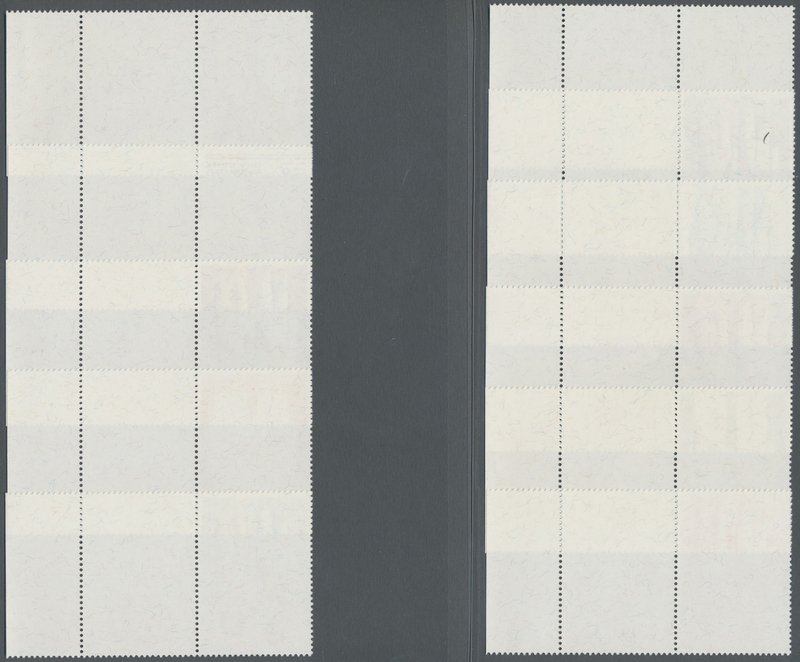 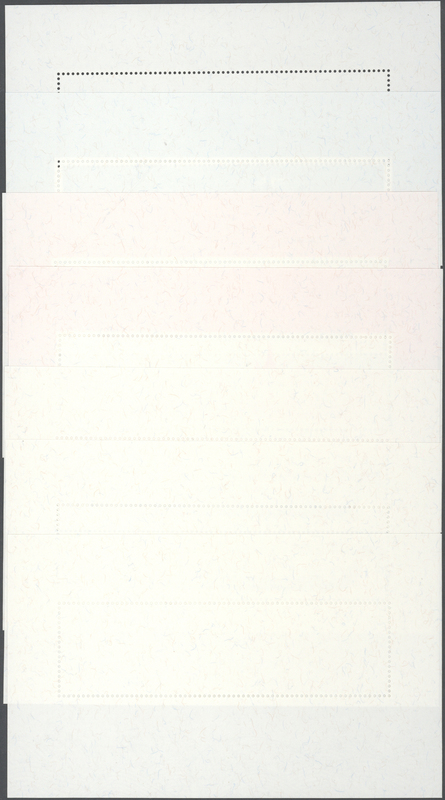 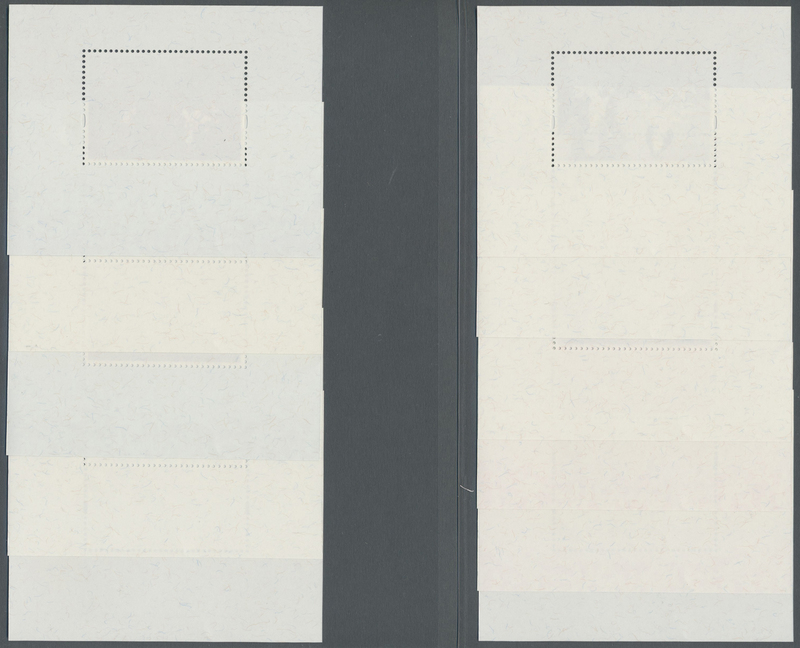 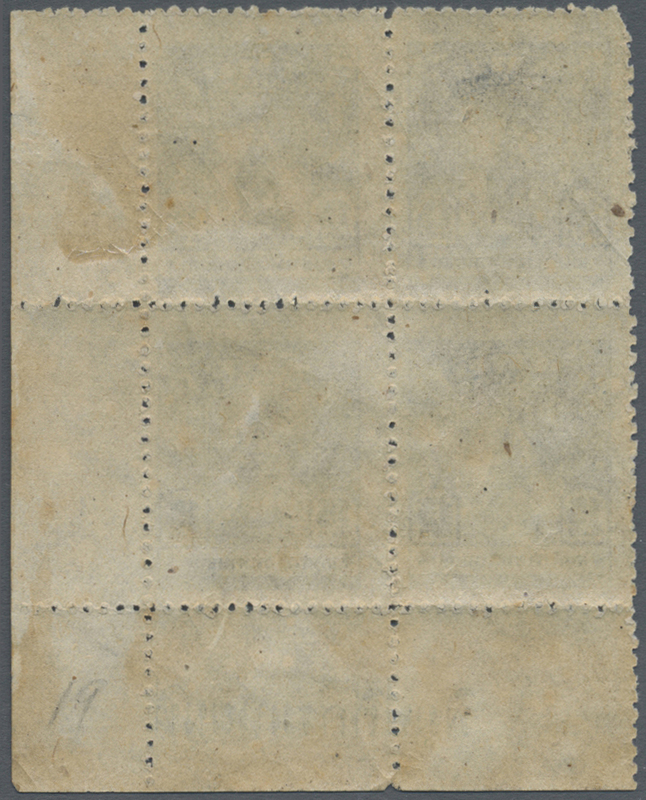 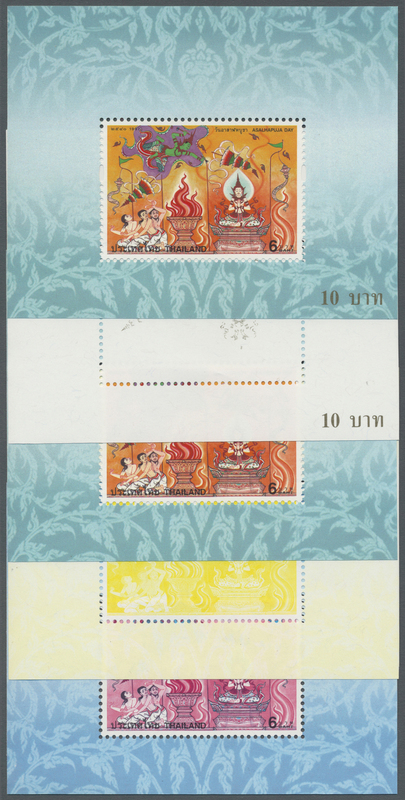 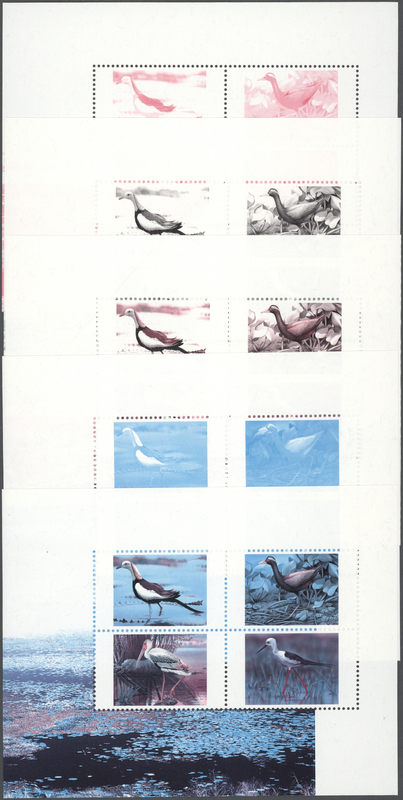 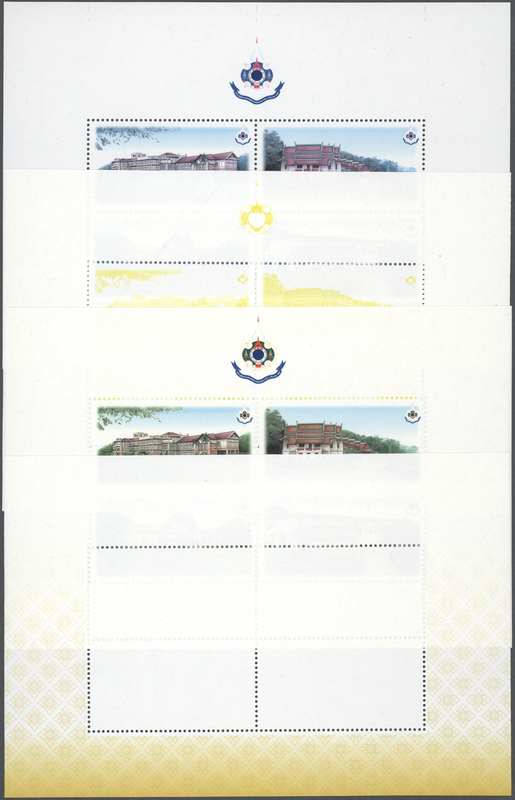 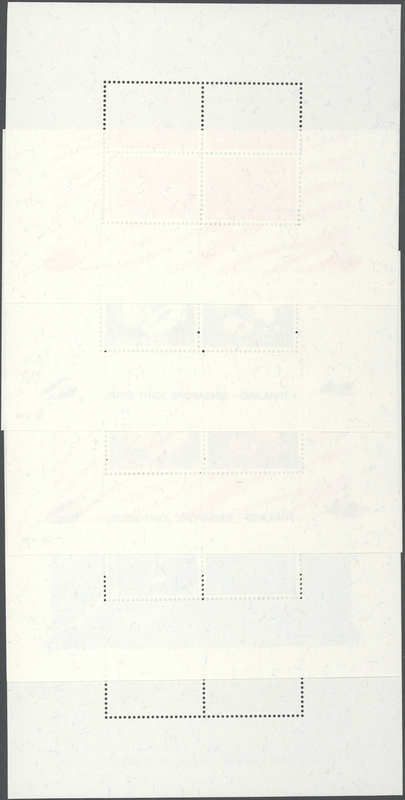 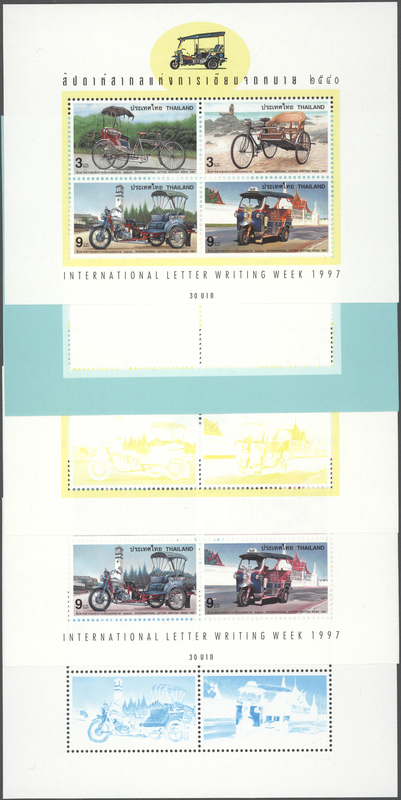 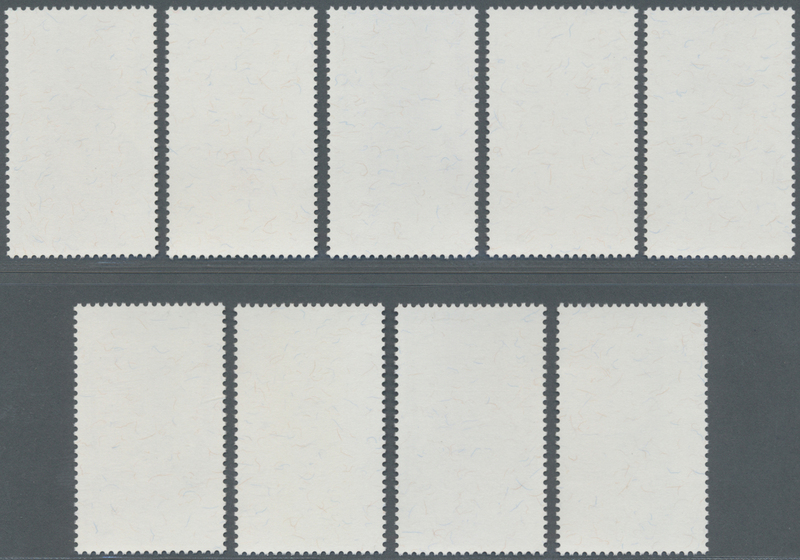 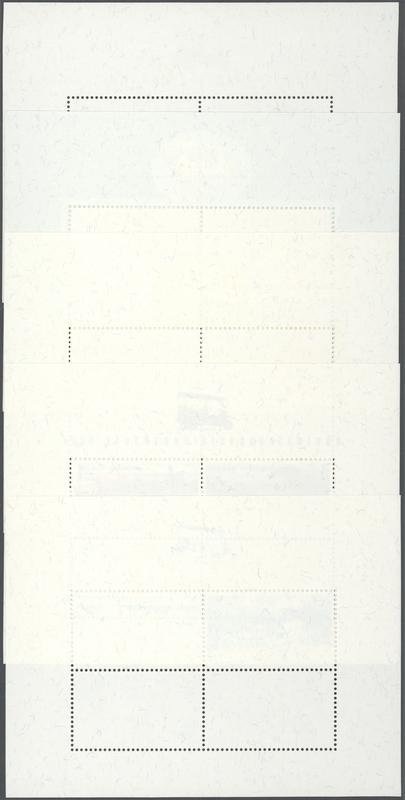 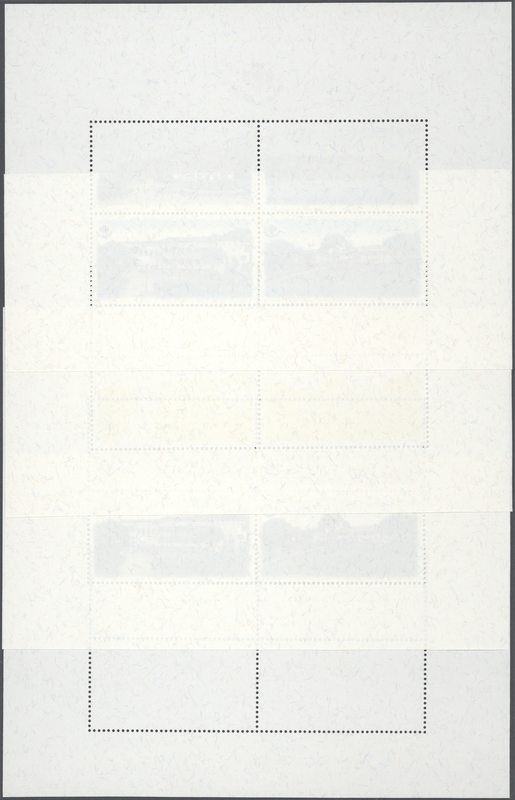 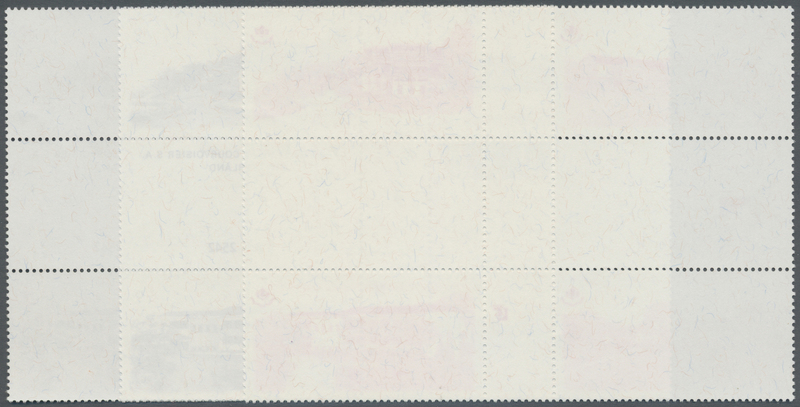 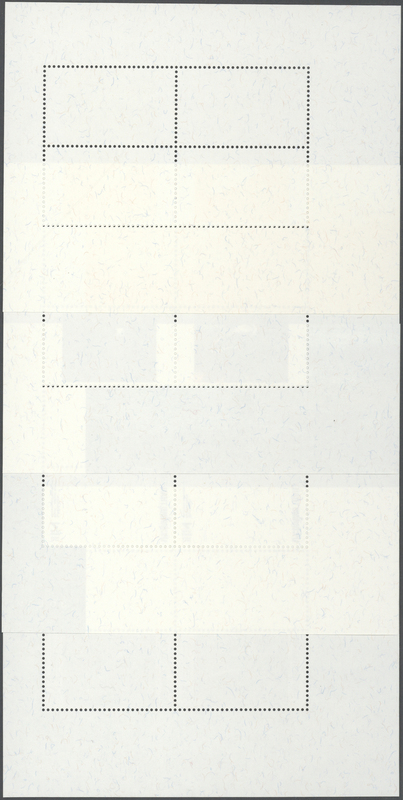 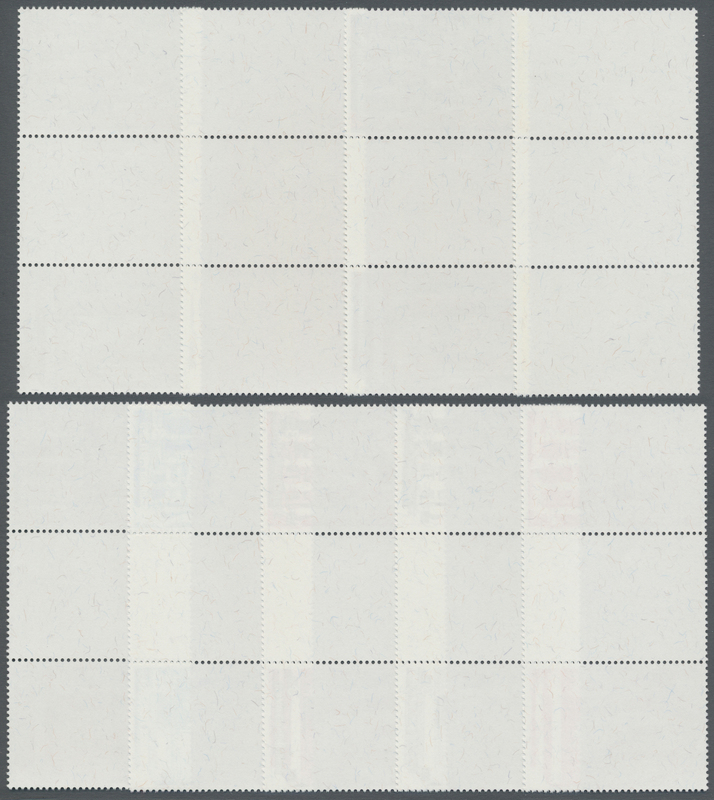 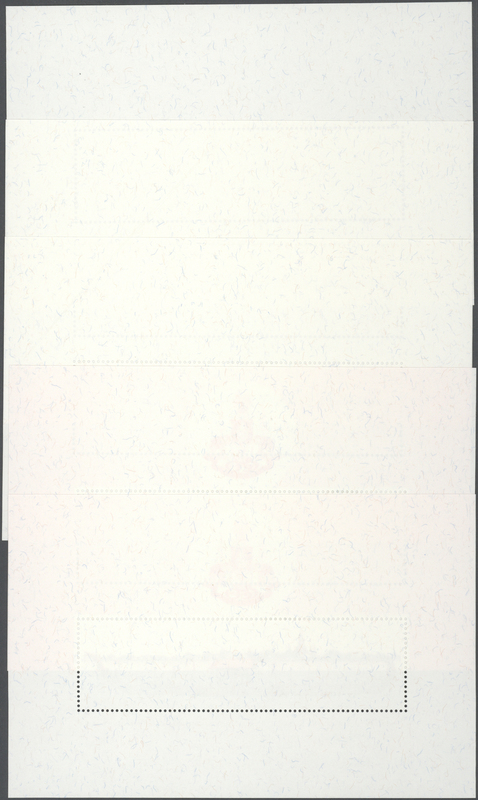 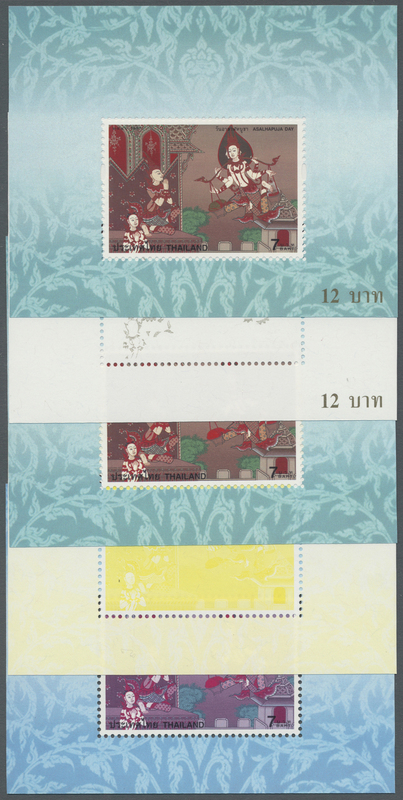 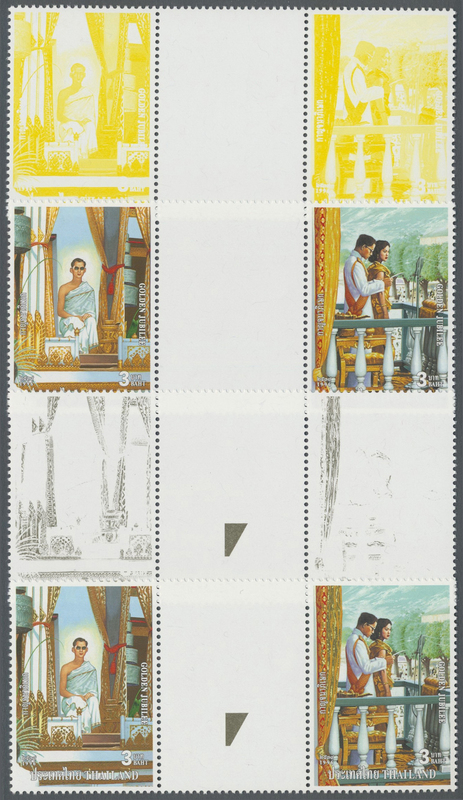 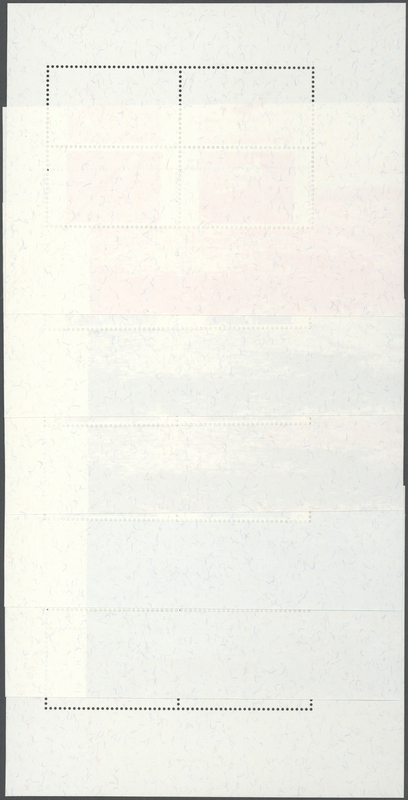 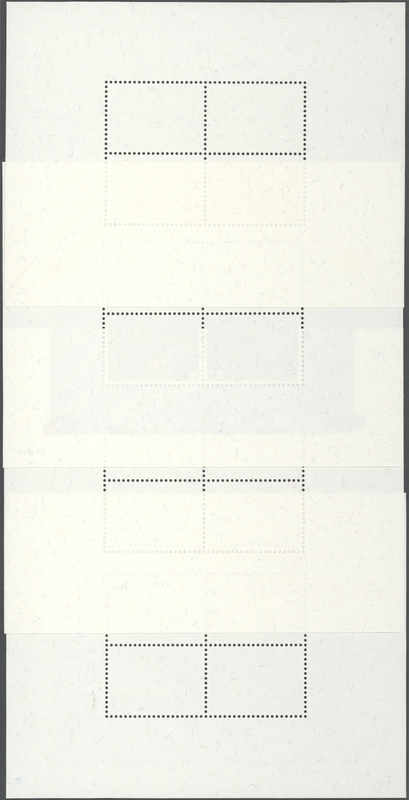 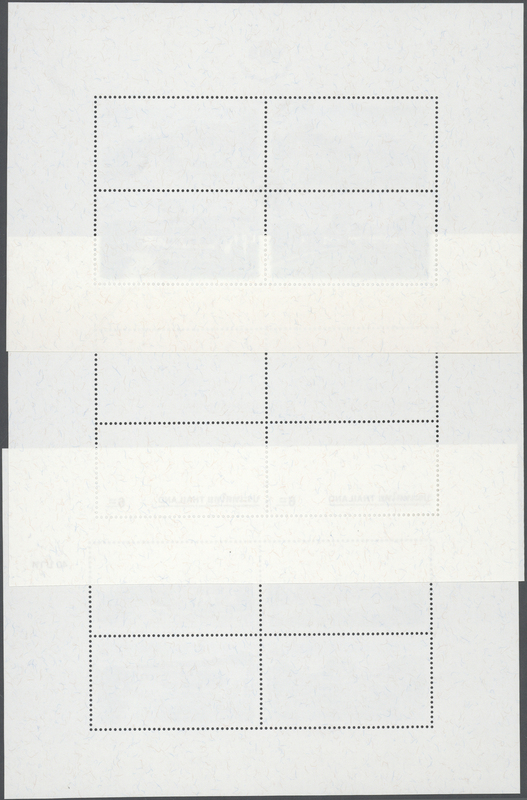 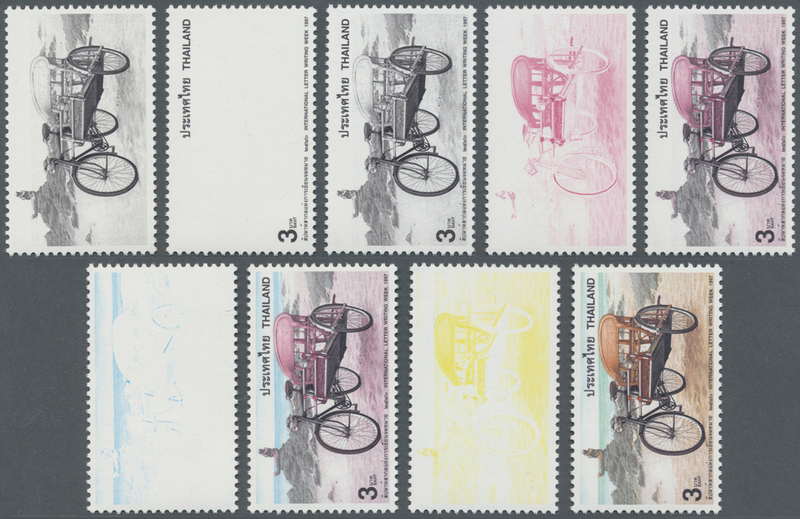 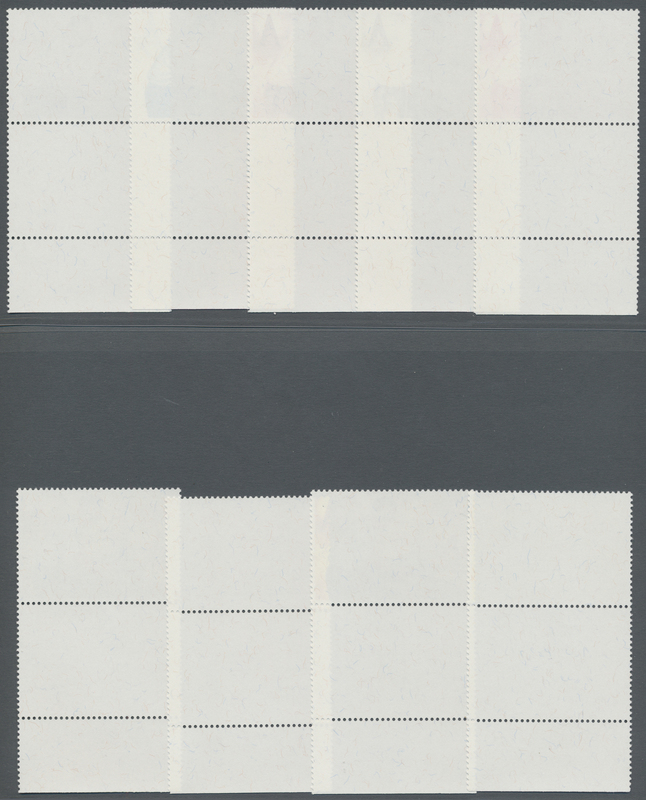 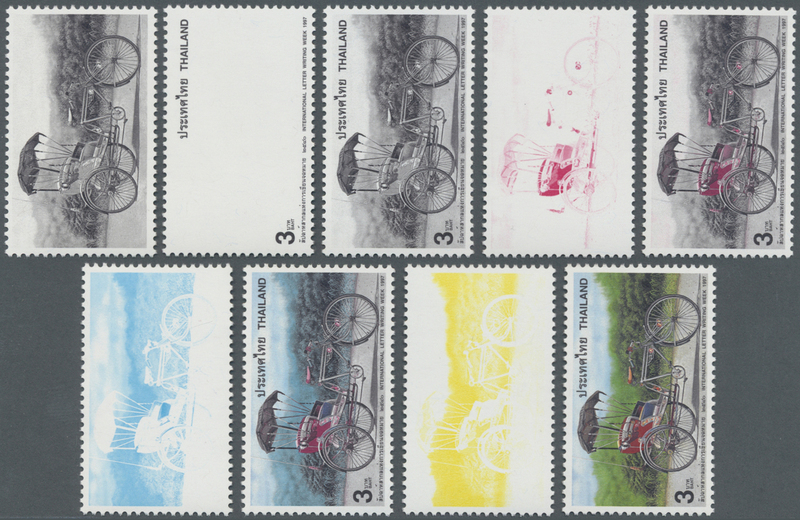 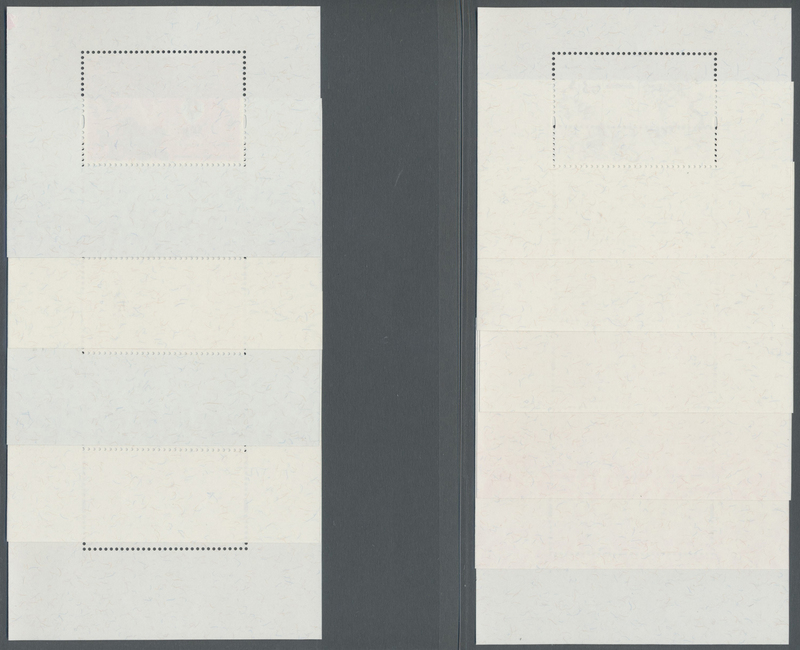 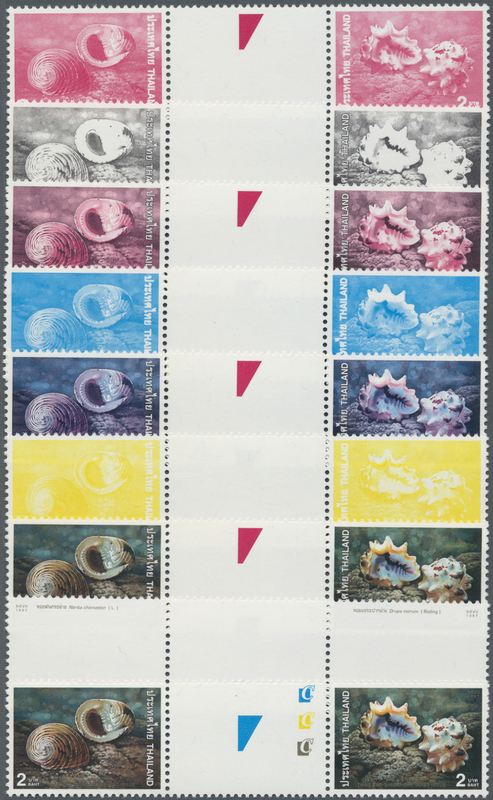 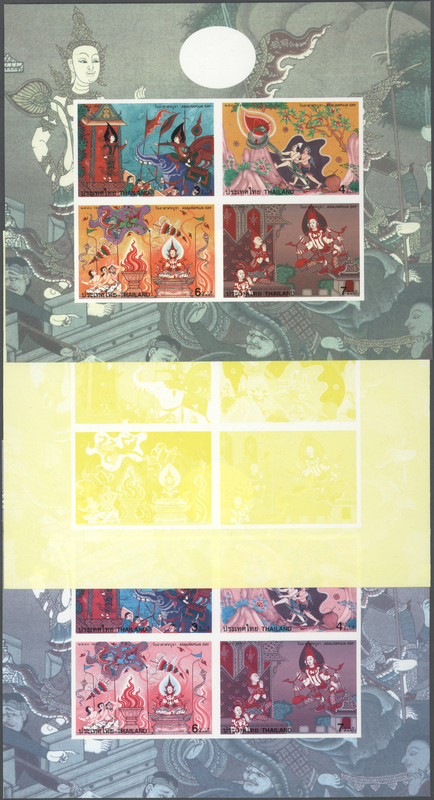 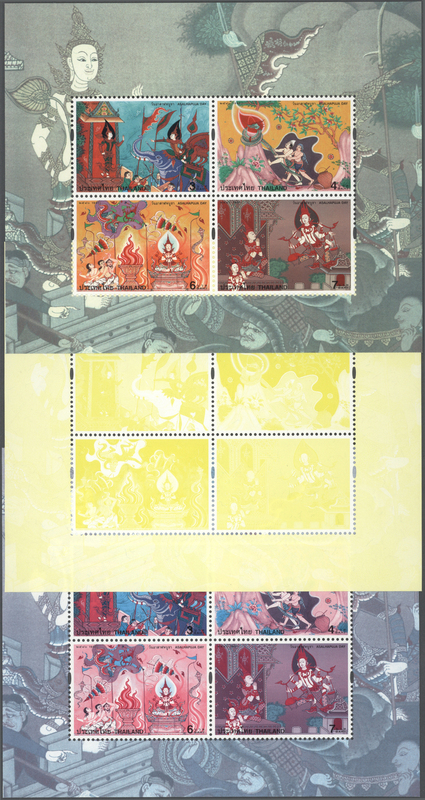 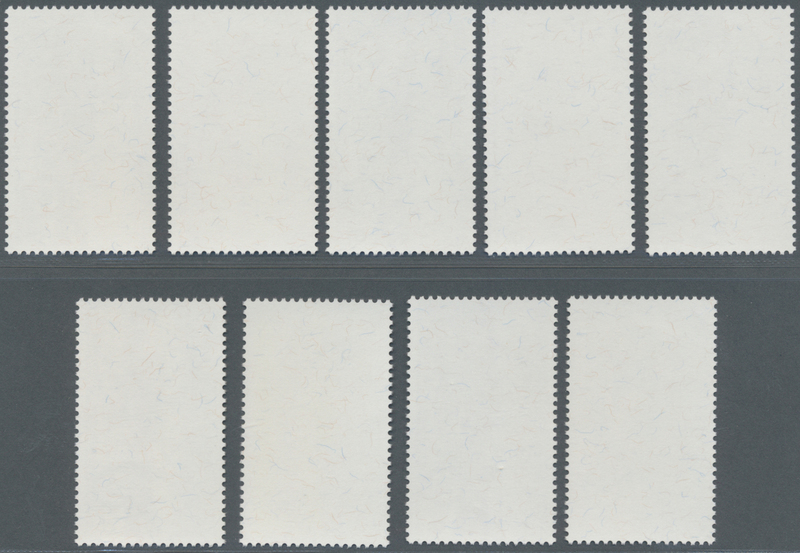 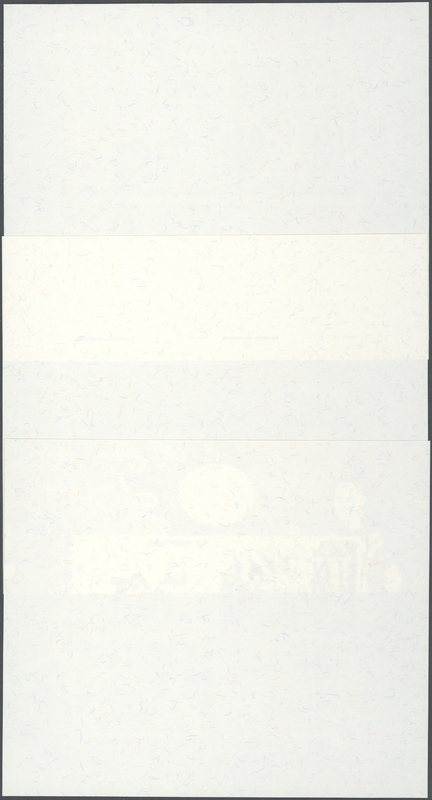 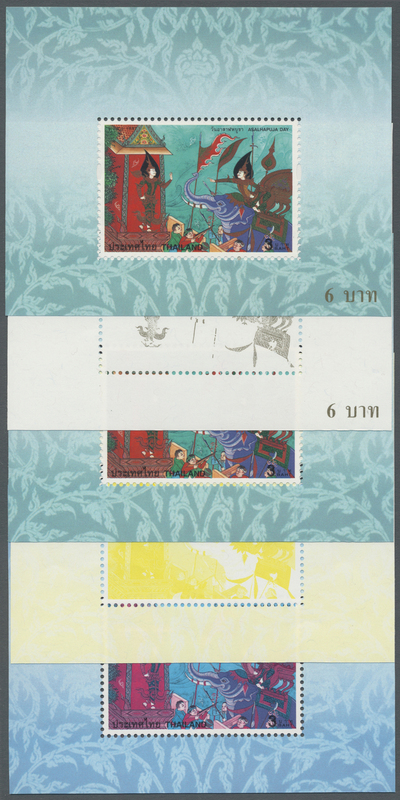 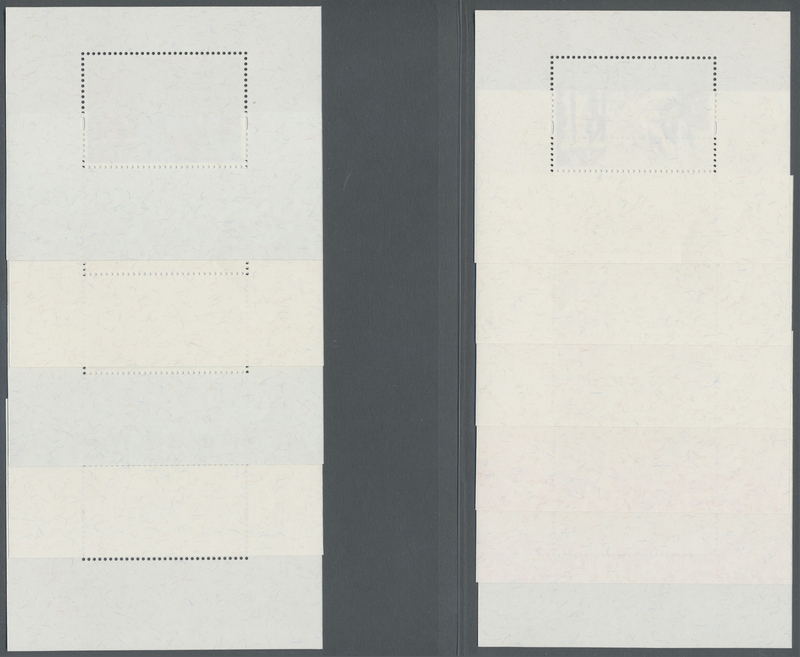 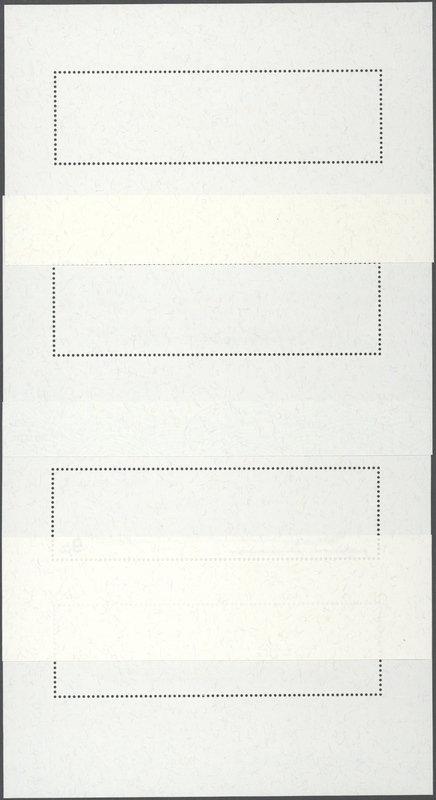 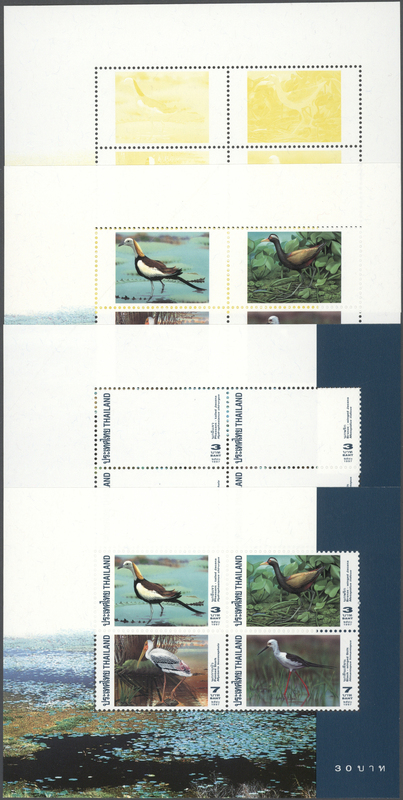 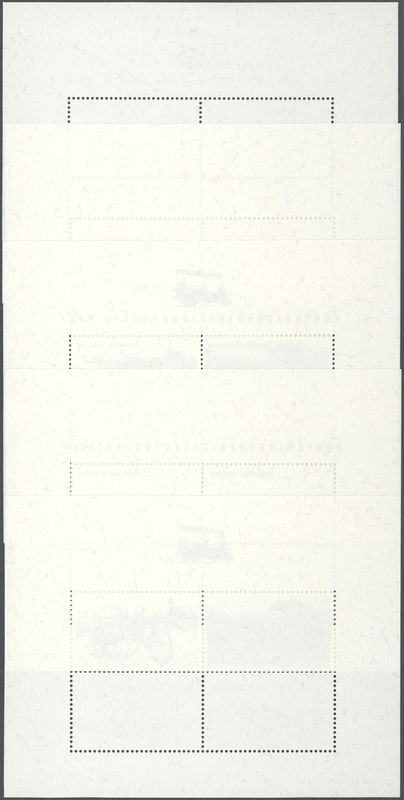 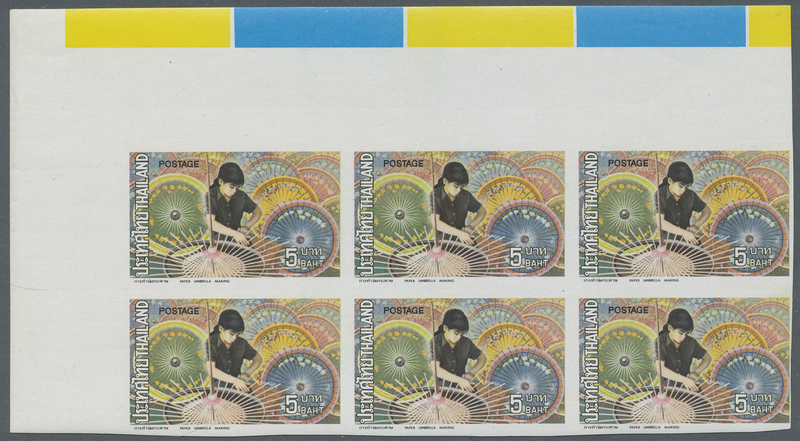 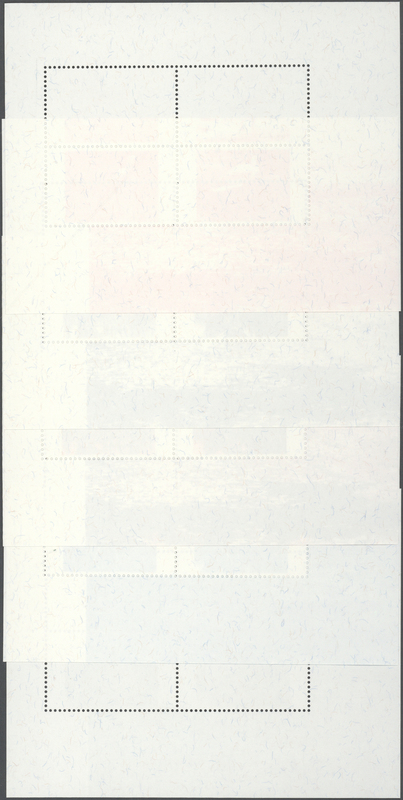 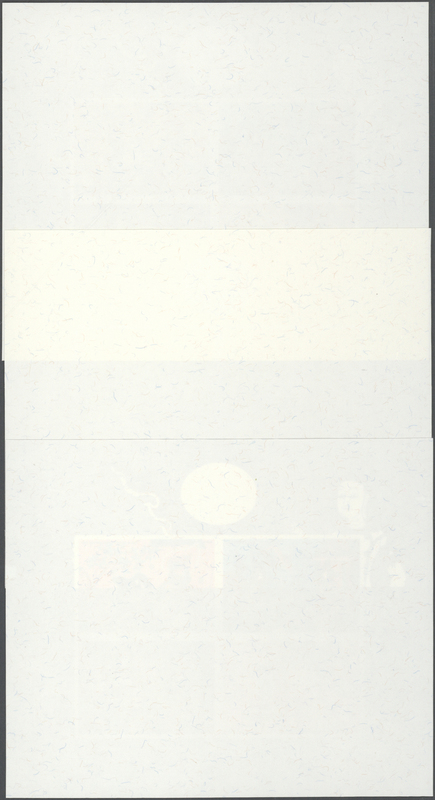 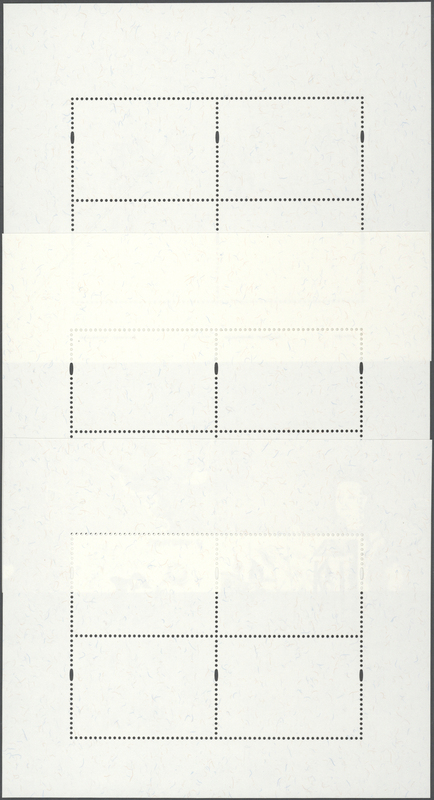 yellow, bottom right corner block of four, unused without gum as issued, diagonal corner creases (through sheet margins at bottom right only), fine. 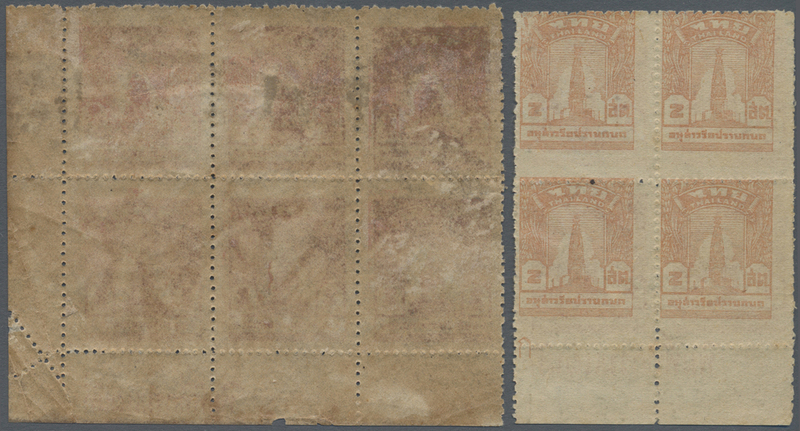 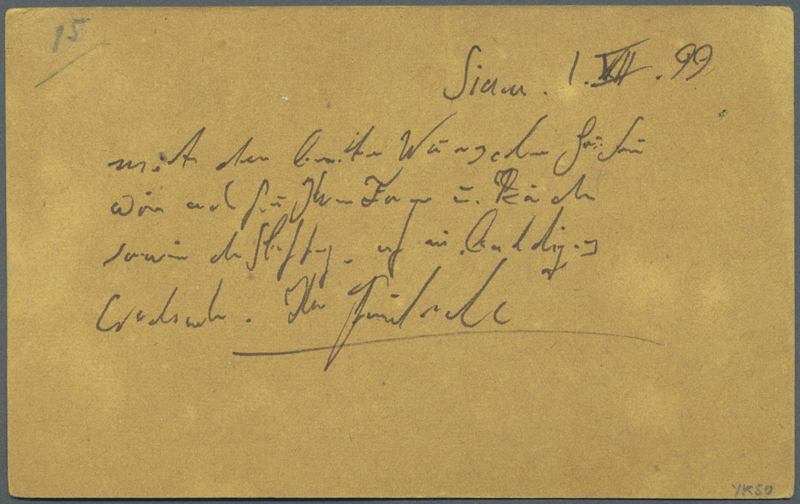 9917 ungebraucht ohne Gummi (unused without gum) (*) postfrisch (never hinged) ** 7A(4), 7B(6) 1944 2c brown, bottom marginal block of four, Perf 13, with sheet marginal inscription shifted upwards, mint never hinged, plus bottom right corner block of six, Perf 13x11½, misperforated due due folded corner at lower right, unused without gum as issued, lightly stained. 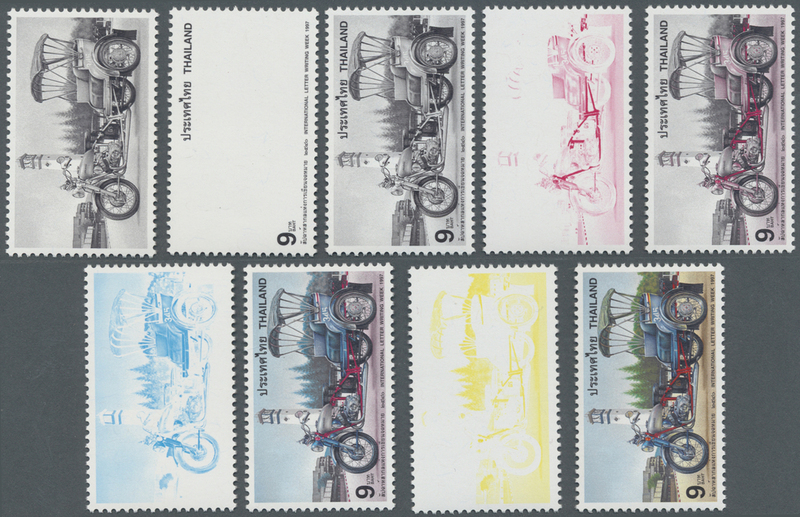 9918 4er (Block) ungebraucht ohne Gummi (unused without gum) (*) 10A (8) 1944 Two bottom right corner blocks of four of 8c. 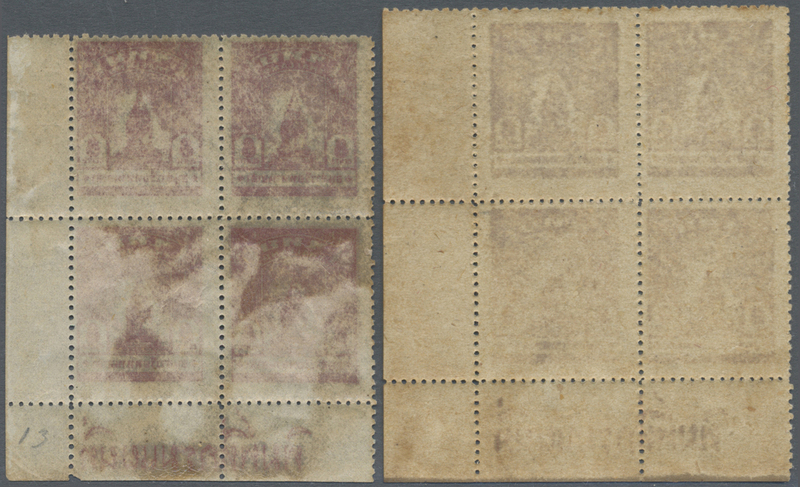 rose, from different printings, one on thick coarse wove paper, unused without gum as issued, the other on fine thin paper, mint never hinged, both with traces of ageing, but still a good/fine and attractive duo. 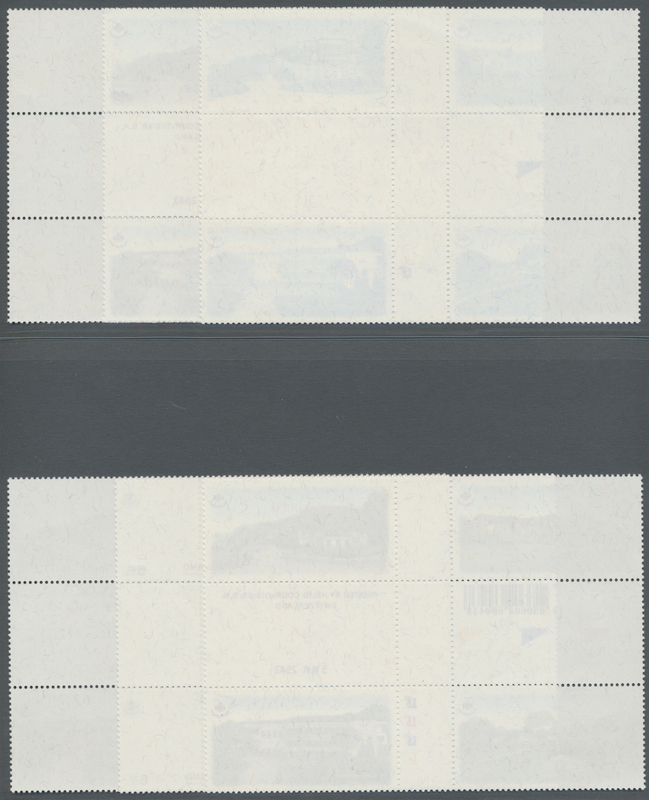 9919 4er (Block) postfrisch (never hinged) ** 11C (4) 1944 15c. 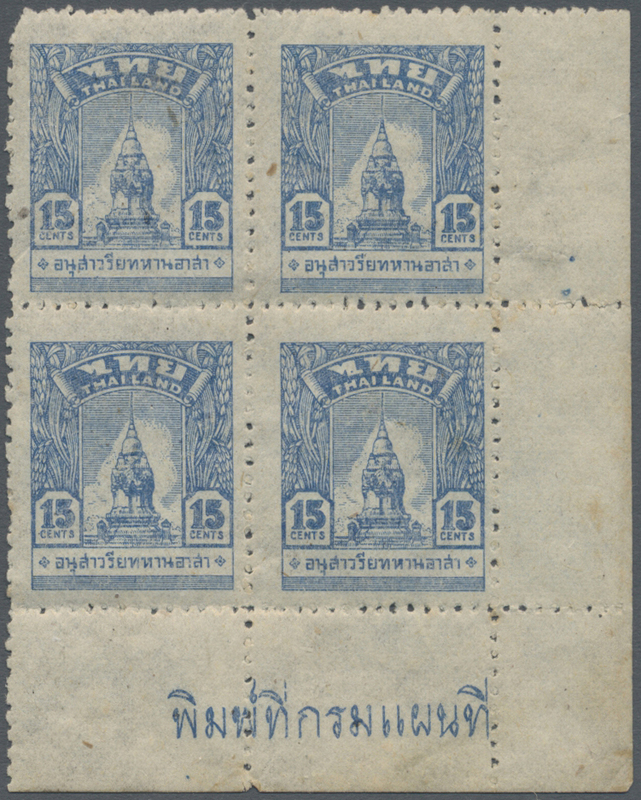 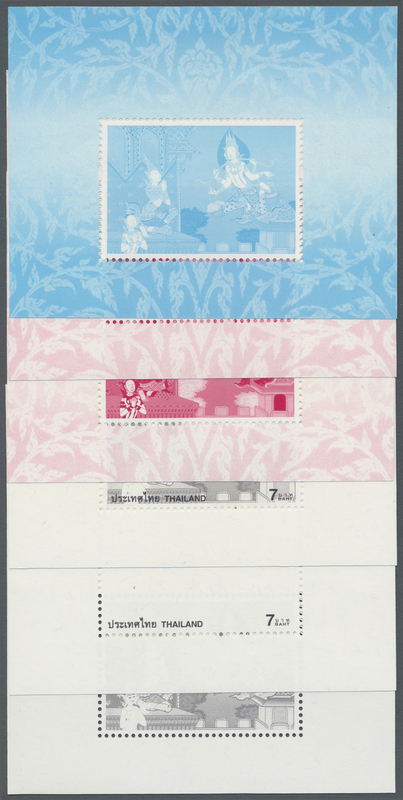 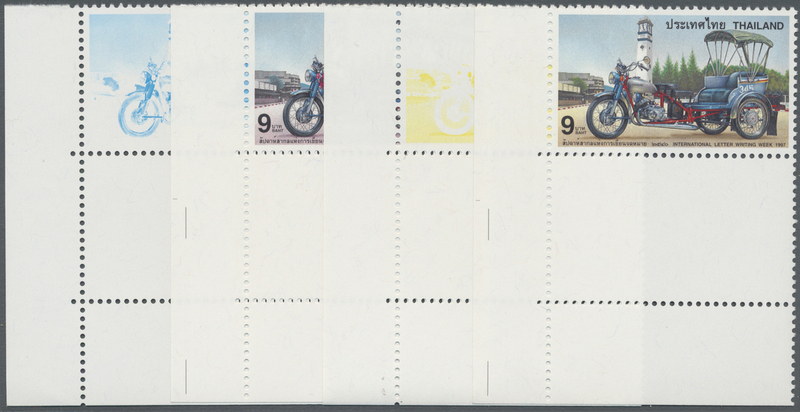 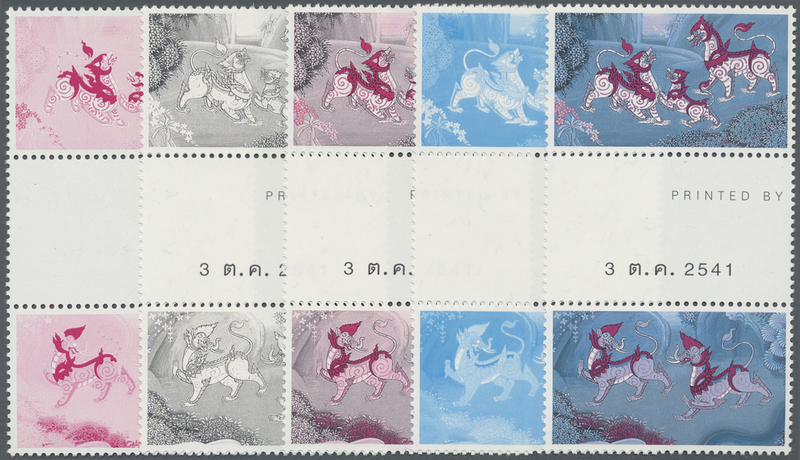 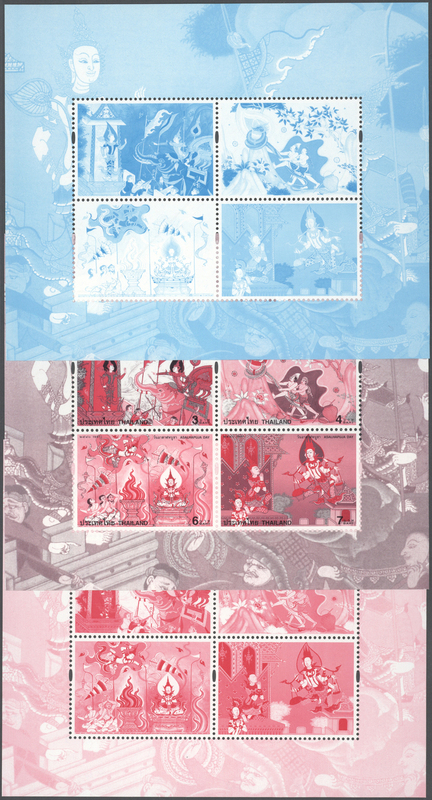 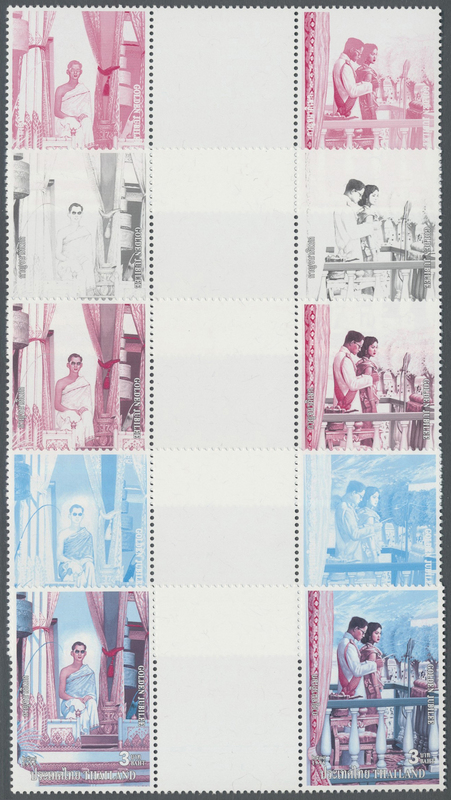 blue, Perf 13x11½, bottom right corner block of four, mint never hinged, stamp at upper left with a corner perf fault otherwise fine. 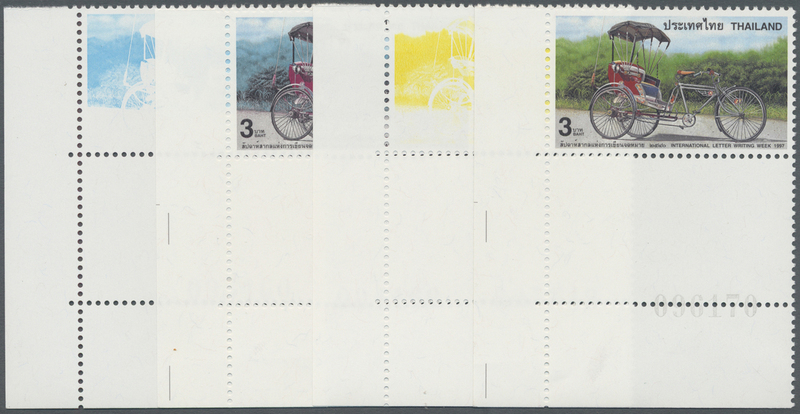 A scarce multiple of this good stamp. 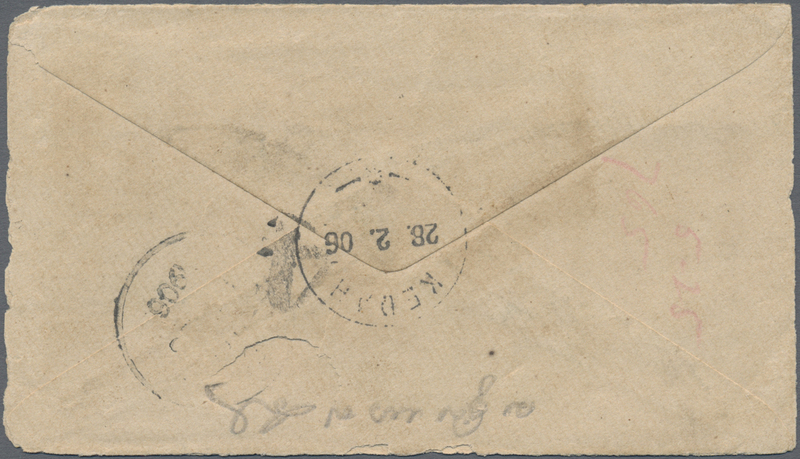 9920 Ganzsache (Complete) 1885, card 1 Att. 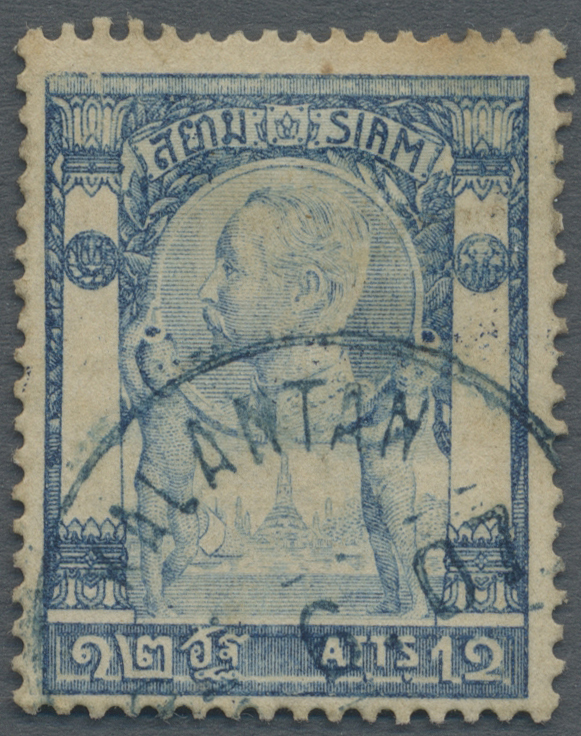 uprated 2 Atts/24 A. and 1 A. canc. 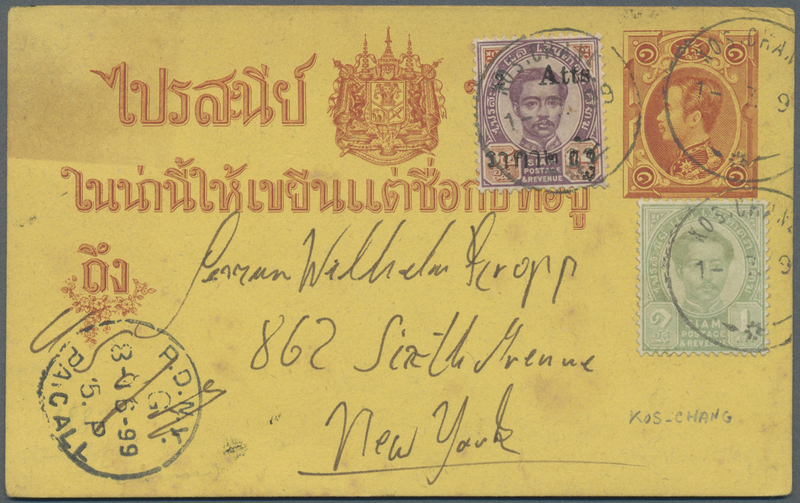 "KOS.CHANG 1.7.99" to New York, transit San Francisco, slight toning.